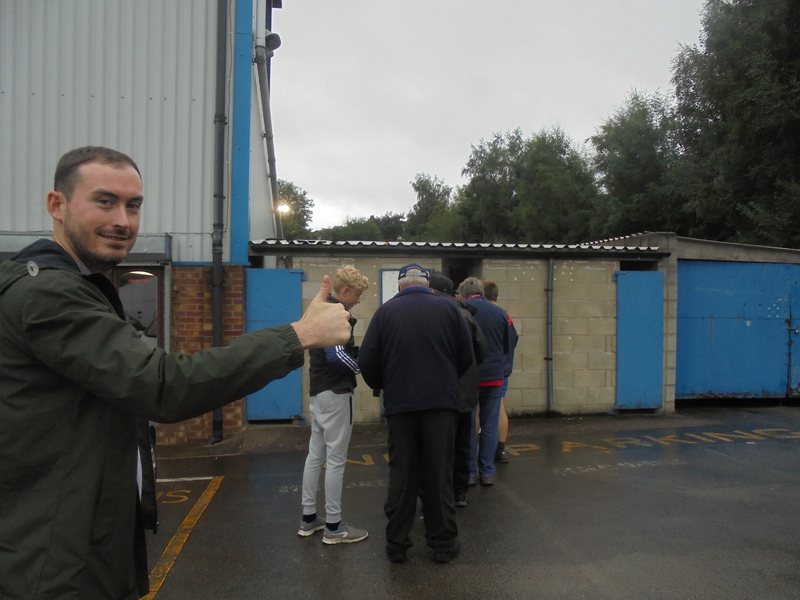 A first “proper” midweek blog in quite some time saw me heading into North Staffordshire for this FA Cup replay. 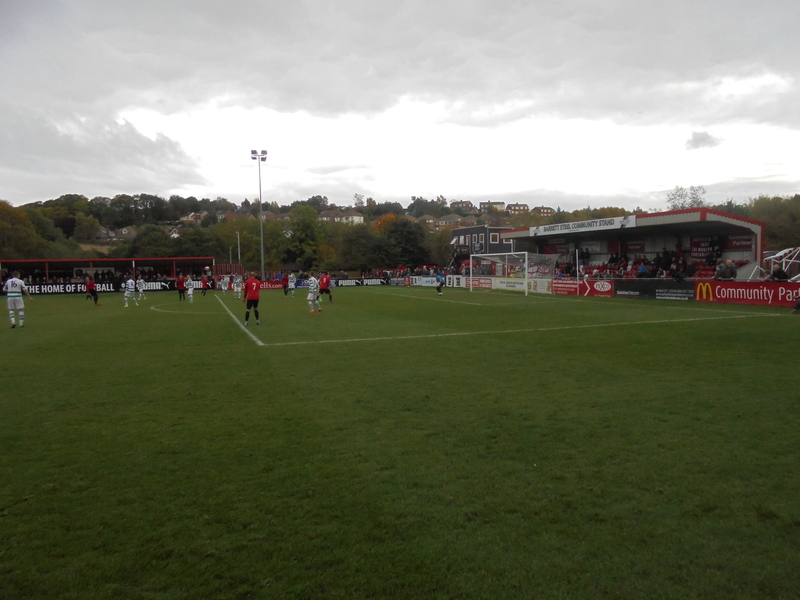 Kidsgrove Athletic, based north of Stoke, forced a second go-around in this tie by holding Trafford to a 2-2 draw the previous Saturday and gain home advantage for a place in the First Qualifying Round. 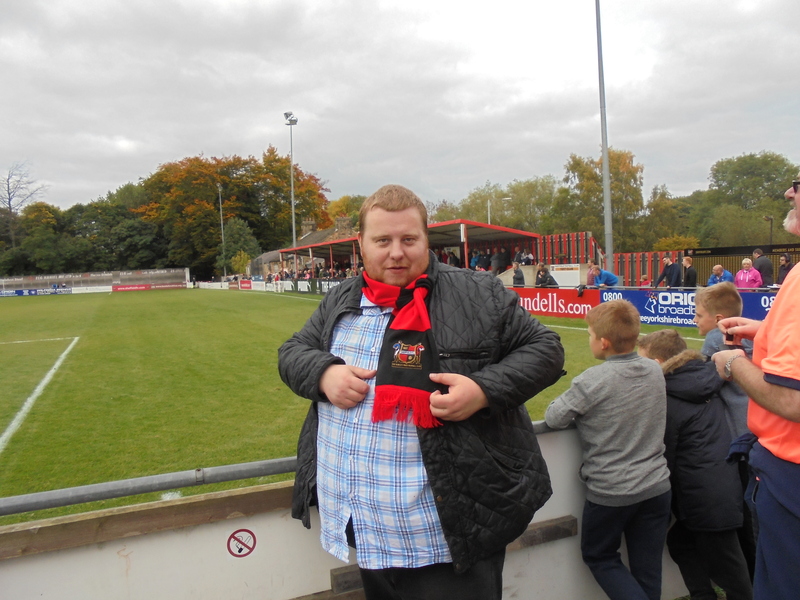 Knowing there’s not much to Kidsgrove from other blogs and my own research, I was getting a lift straight to the game off Trafford fan Cappy, who has popped up in my blogs from time to time, the latest being in the round previous at Athersley Recreation vs West Didsbury & Chorlton. After being picked up along with other away fans Gaz and Paul, it was straight to Hollinwood Road for us. After making good time in avoiding the usual trouble-strewn M6, we arrived at the gates of “The Grove’s” home at just before half-past seven. Being dropped off outside as Cappy went in search of a parking space (few and far between at that point), a quick entry (£8 in) plus grabbing a programme and a teamsheet off the lady within the closed off turnstile, saw me all set for the game. Gaz was most pleased by the fact he grabbed the last of the programmes on offer! Before long, the sides were heading out onto the field with daylight still just about enough to mean the floodlights were not really required for the first half. 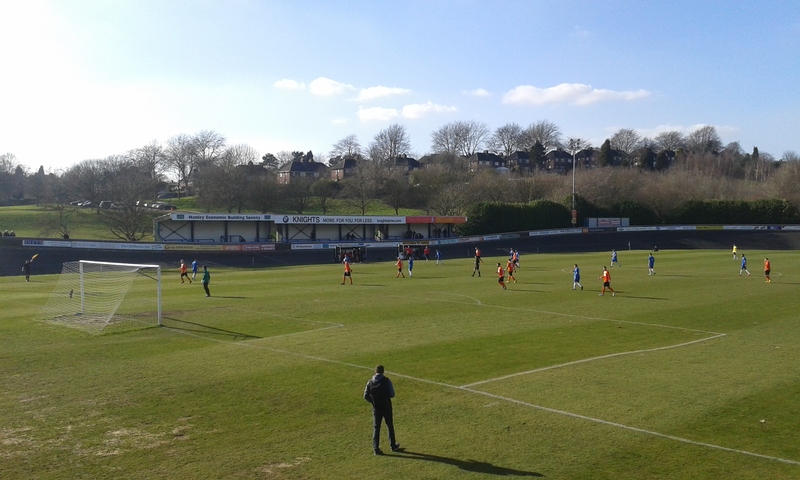 As for the ground, it’s a pretty decent one, housing four stands with seating available on both sides and at both ends, largely orange-orientated, for some reason, despite Kidsgrove playing in blue and the older looking stand fitting in with this colour scheme. The ground also has a nice backdrop of trees at the far side. 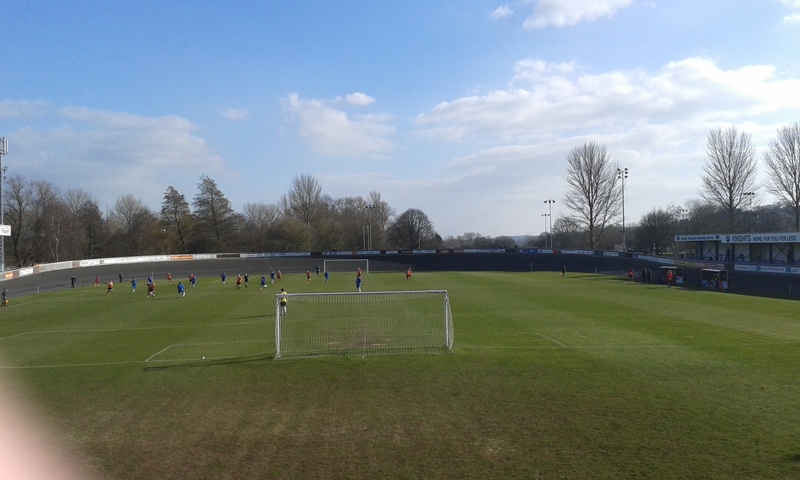 Kidsgrove Athletic FC was founded in 1952, after a group of disillusioned local players formed the club after the re-formed (after WWII) Kidsgrove United decided to use players from outside the area. United had been the town’s club pre-war. Athletic, meanwhile, began life in the local Burslem & Tunstall League, originally playing on the Vickers & Goodwin pitch near the A50, before taking a year out of football in 1961, with all efforts on developing a ground on the current site at Clough Hall, which may give a clue to their success in this venture! Not sure what this once was? The club returned to the playing field in 1962 and won the Burslem & Tunstall League that year. They’d go on to join the Staffordshire County League in 1963, winning the Division 2 title in their first year there before taking the Division One title in 1966. As a result of this, the ‘Grove switched into the Mid-Cheshire League for the ’66-’67 season, winning it on four occasions (1971, ’78, ’87 & ’88), along with lifting the Mid-Cheshire League Cup three times (1968, ’70 & ’86). 1990 saw the club take a further step up and enter the North West Counties League for 1990. 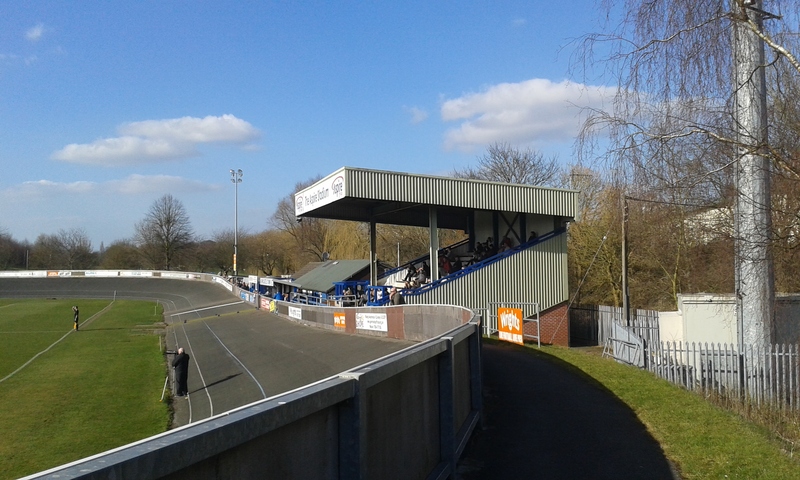 Promoted in 1991-’92 due to ground grading, the club struggled initially before finding its feet and winning the NWCFL title twice (1998 & ‘2002), the latter of which earned Kidsgrove promotion to the Northern Premier League. After struggling at the start of their stint here, they progressively moved up the table and they would eventually reach the play-offs of the now regionalised Division One (South) in 2010, but would lose out to, the sadly now defunct, Glapwell. After a period of managerial instability in recent years, the club ended up in a solid 12th place at the close of the last campaign. The game was a tight affair during the first period, with neither side seemingly looking to push on, perhaps afraid of being caught as a result of doing so. Thusly, chances were few and far between, the visitors being restricted to a couple of long-range efforts and the influential, experienced frontman Anthony Malbon firing over when well placed with what was probably the best chance of the half. 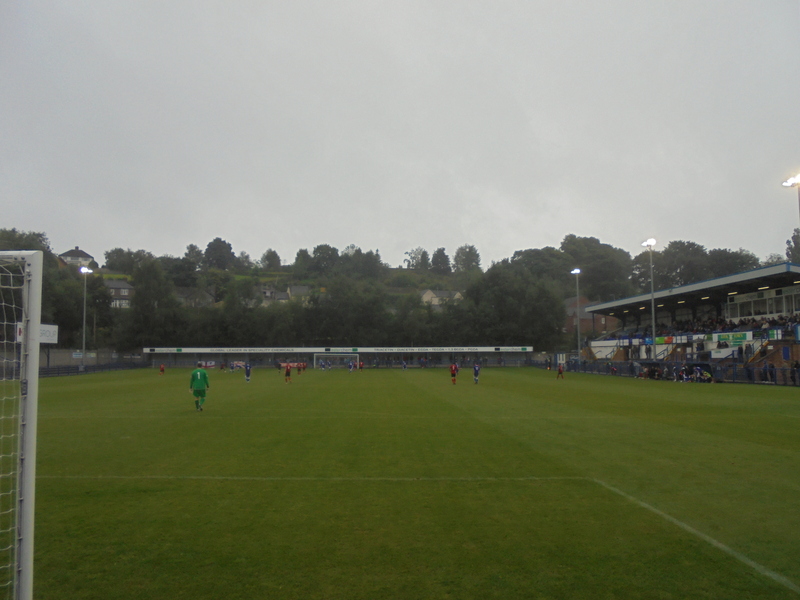 Despite the lack of overall chances, the game was a watchable one on a good playing surface. 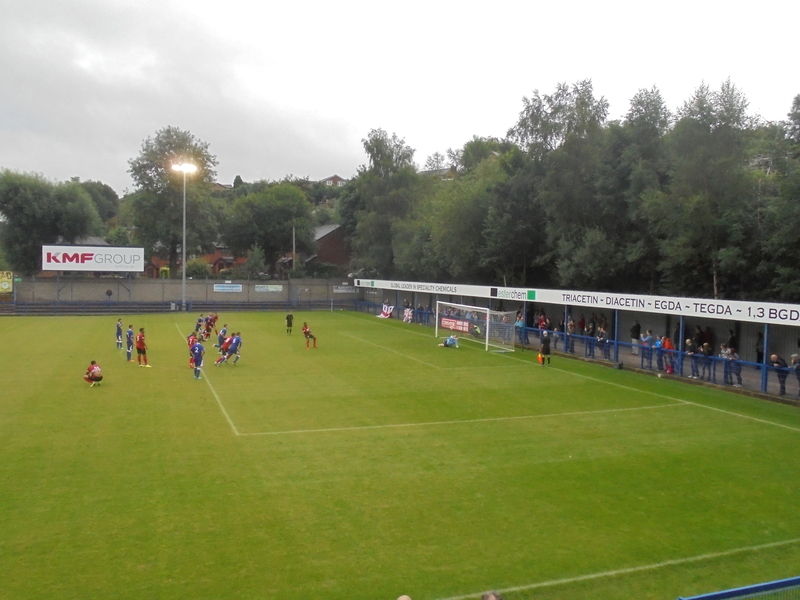 Kidsgrove, with more width to their play, always looked the more dangerous and almost forged ahead on around the half-hour, but Trafford ‘keeper Grant Shenton held on well to a Ross Davidson strike, considering he looked to have seen it late. As it was, there was to be no breakthrough in the score-line and the sides headed in at the break in deadlock. 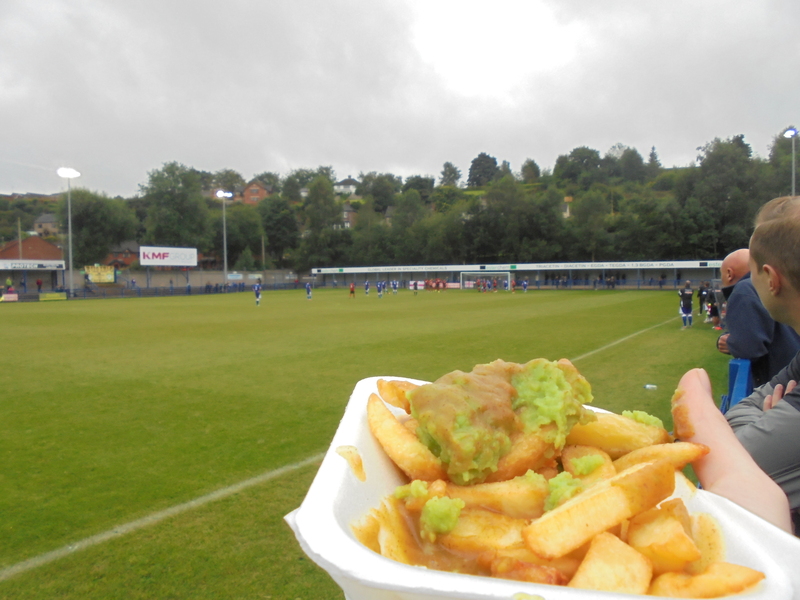 At the recommendation of Gaz, my half-time snack consisted of chips & curry for £2 and they were well worth it. Really good stuff. After a swift visit into the Phoenix Club for a look around (whereupon I came across its numerous Nepalese/Himalayan area décor), it was back out for the second period. 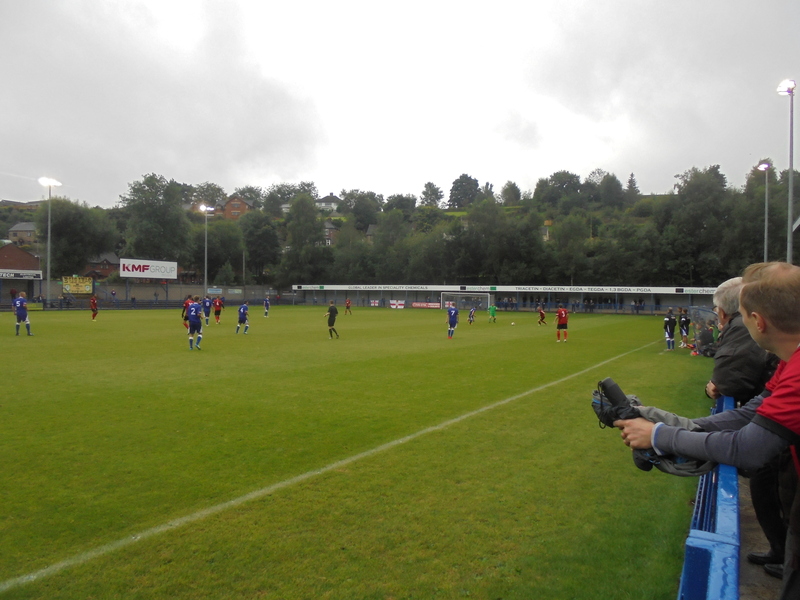 From the off it became more apparent that Kidsgrove had the upper hand now, indeed Cappy stated at the break that Grove seemingly had a “second gear” to go into, and that definitely looked to be the case. 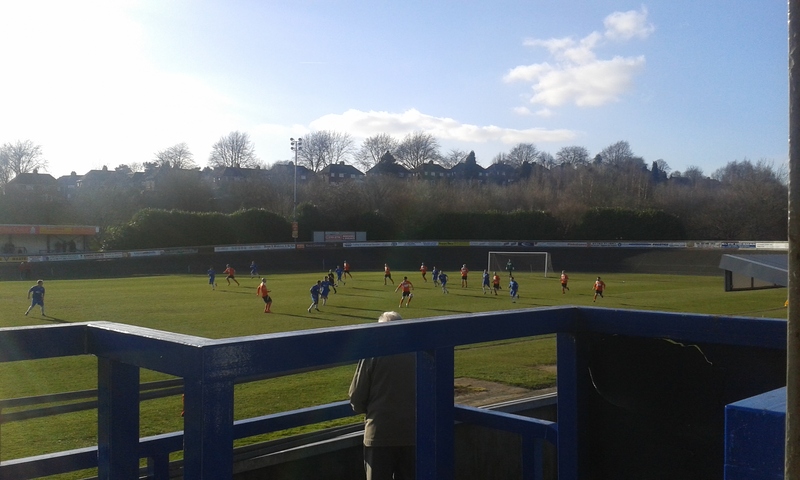 Shenton got away with an early error, when a poor clearance was fired over but he was to be more unlucky soon after when Kidsgrove deservedly went ahead. 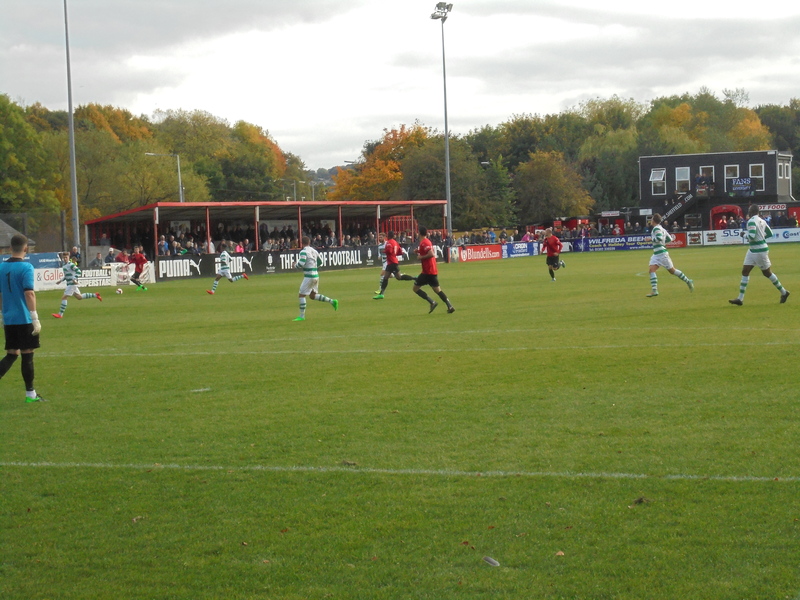 After Trafford’s Ally Brown had been denied by ‘Grove stopper Dave Parton, in the visitors’ best chance of the tie, Parton’s opposite number pulled off a good initial stop to deny Malbon, but the ball fell to the feet of Lee Cropper who unerringly did the rest, in calm fashion. You felt it’d be a long way back for Trafford from here, considering the lack of penetration they’d had to that point in the game, the forward line proving ineffective in breaking down the solid-looking home defence, marshalled well by the “gaffer”, player-manager Ryan Austin, the ex-Burton Albion man who was part of the side who played at Old Trafford in this competition a number of years back. Indeed, 15 minutes later, it was game, set and match to the hosts. A long-ball downfield found Malbon who was adjudged onside and he left the vain appeals of the Trafford defenders behind him to coolly finish beyond Shenton for two-nil, to send the crowd and those in the raised hospitality box into raptures. 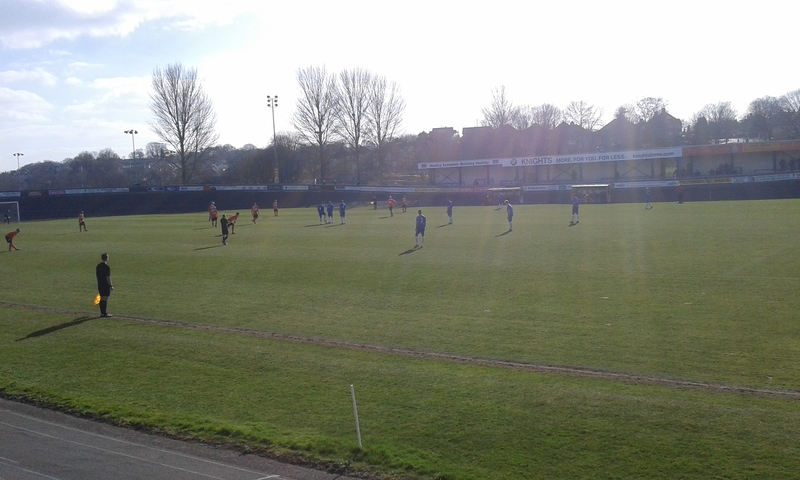 Kidsgrove were heading for the next round and a date with Clitheroe. Not much occurred during the latter part of the game, and the ‘Grove saw out the remainder of the tie to signal a fine win against the seemingly depleted visitors (they only had three on the bench). 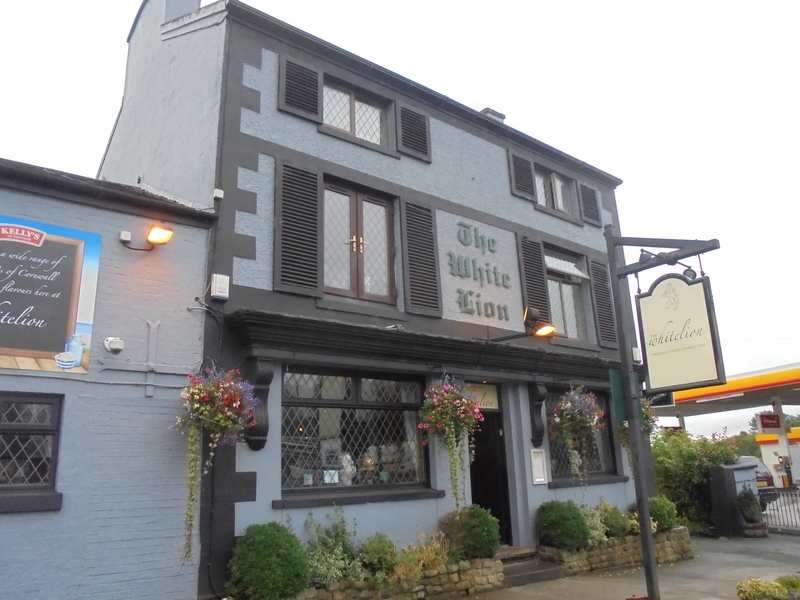 As for us, it was straight off via an initial stop off in the fine, thatched roof-style “Bleeding Wolf” Robbie’s pub. 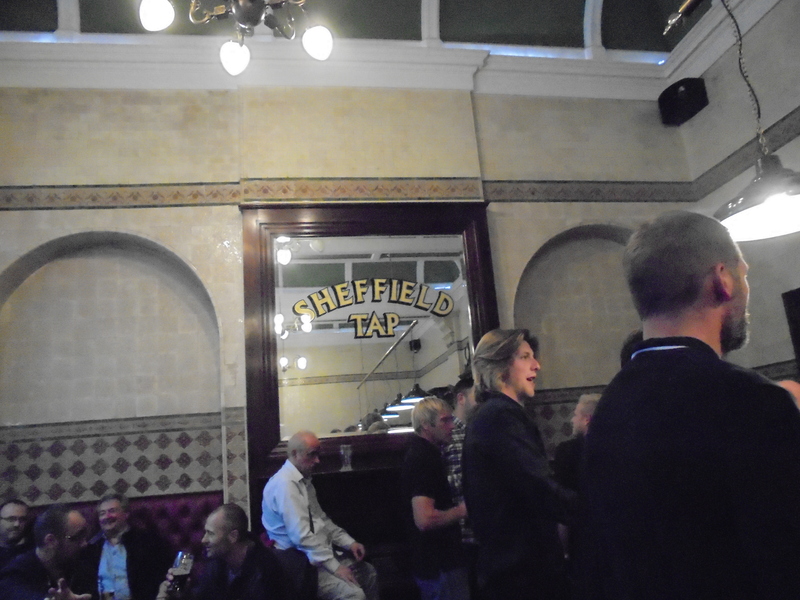 Cappy’s observation of the match was this: “Well, the pub’s better than the match!”. It was packed within this old, carvery pub with standing room only in force, with a band relaxing at the rear having finished up their set. Nothing alcoholic for Cappy of course, but there was no such bad luck or responsibility for me and a pint of Stowford later (plus a read of the local legend regarding the pub, a huntsman and the King), we were headed back into the night for a second stop-off….and here’s where the silliness begins! En route to Congleton, Cappy headed off for the Swettenham Arms , which cued us travelling along dark country lanes with no other souls in sight, bar the odd rabbit which would pointlessly risk its life by darting out in front of the car. Finally arriving in some sort of civilisation, we discovered the Swettenham was shut. No haunted pub for us…none at all it seemed. 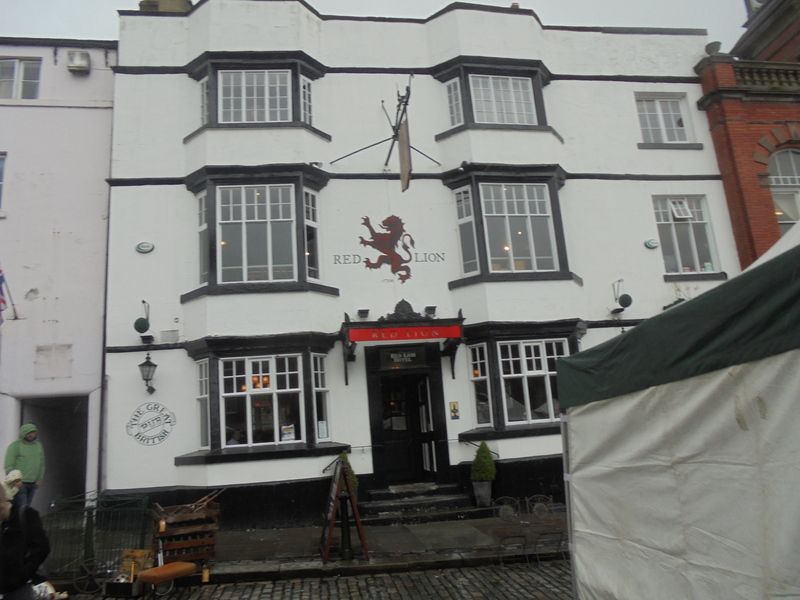 But then the Red Lion was remembered and off we went again. Shut. Ah. With all options seemingly exhausted, it was off home via the odd diversion. Until we got to a roundabout near Over Peover. “There’s a sign for the Dog Inn”, I called to the rest of the car and thus we circled around said roundabout three or four times whilst debating whether we’d make the two miles in six minutes. Cappy decided to the affirmative for us and we arrived at the entrance to the Dog in some fashion, with my plan of action being put into force. That plan of action? The nearest to the door dives out and legs it in. At one minute past eleven, we came to a halt, the door swung open and Paul sprung out to shouts of “GO, GO, GO!!! !”, with one guy walking past with his dog probably thinking he was about to witness the worst pub raid in history. After parking, we joined Paul within to find all things calm as…..it was open until midnight! Fun and games over, we settled in for the next half-hour (pint of the fine Portland in here) before setting off once more. Apparently, my dramatized story pretty much came true. This is how things went: Paul jumped out the car, through the gate, threw open the pub doors as those inside turned to see what was going on, before asking if there was time to be served. He was met by the flat response “Yeah, we’re open until twelve.” I can’t do it justice in words, it was just pure craziness and a great way to end the evening, never mind the “Brian the mechanic” call-in show on the radio. 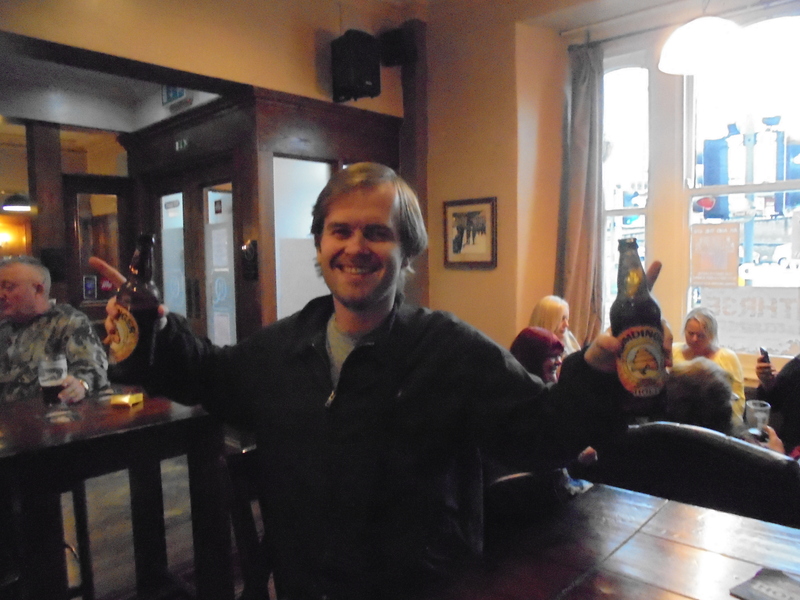 So ends this tale of an underwhelming footballing match transforming into a crazy pub search. But this is what the FA Cup does to people, I guess! Anyway, Saturday sees a return to the 92 trail, before the Cup returns a week after. However, before that comes around, it’s a trip to Runcorn and the Linnets…. The FA Cup trail continues into a third round and after seeing two home wins over the previous two rounds, for Padiham and Tadcaster Albion respectively, the draw threw up a fair few options of where to visit next. 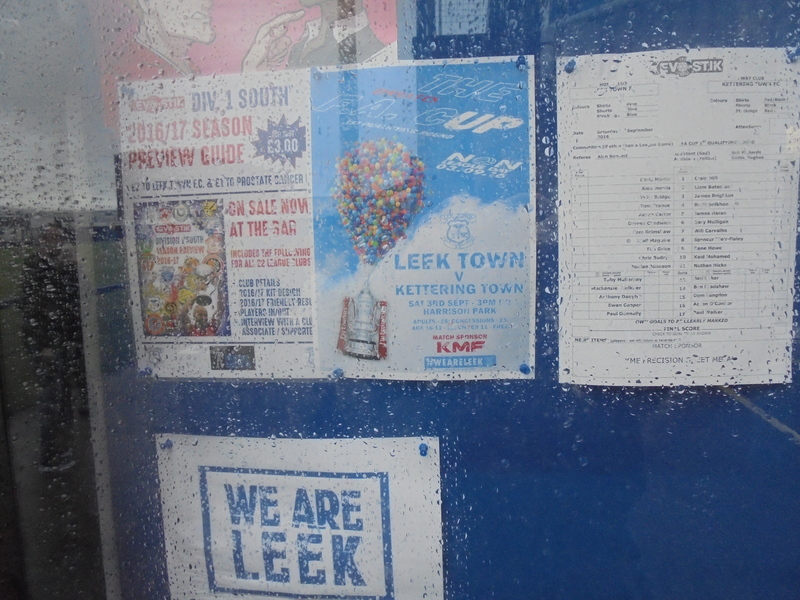 For the task of deciding, a liaison with fellow ‘hopper (and ever more regular blog appearance maker) Paul was needed and eventually we settled on the fine Staffordshire town of Leek and, more notably, Harrison Park, home of Leek Town FC. Non-League Day started in the usual fashion, heading into Manchester while taking advantage of the city’s Wayfarer ticket which stretches all the way down to Leek, allowing a fairly cheap day of travel. After happening to jump on the Norwich-bound train to Manchester Piccadilly at the nearest door available, it just so happened that I’d got on just across from where Paul had stationed himself during his trip over from Liverpool. After a quick change at Piccadilly, we were onward bound for Macclesfield. After being regaled by a guy about the fact the train journey to Oxford was the first his dog had ever taken (you do get some exciting tales), we disembarked in the Cheshire town at just before midday. With around an hour to our bus to Leek, we decided to seek out some cover from the precipitation. Unfortunately, the majority of drinking holes around town were still shut and so we fell into the ever faithful Wetherspoons, Macc’s being titled the “Society Rooms”. 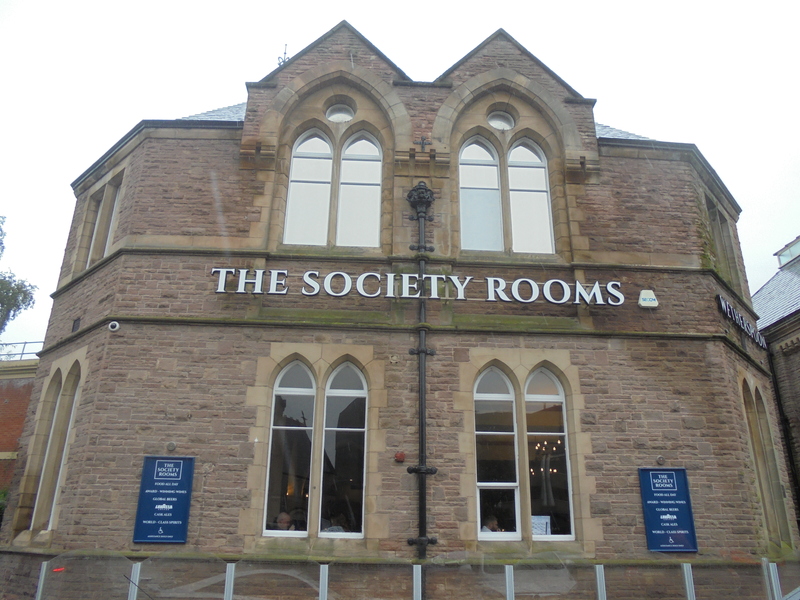 The Society Rooms is a decent, if unspectacular, ‘Spoons, but one that more than passed the test of where to spend a half-hour. With Punk IPA’s finished off, Paul and I headed back uphill, past a restaurant offering “Bombs £1” and to Macclesfield bus station for our connection to Leek. After a small delay, we set off on our pink and sparkle-clad bus, though Paul was far from enamoured with his £5.50 ticket. 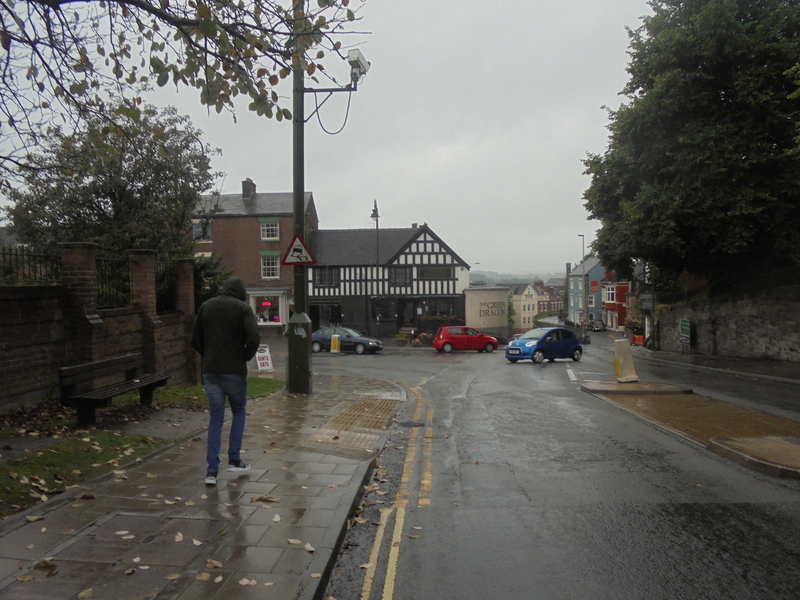 After a half-hour’s journey through the Cheshire countryside, we pulled into the town centre and with the steady rain continuing to fall, headed uphill once more, this time to the town’s Market Place and, more specifically, the Red Lion pub. The Red Lion is a nice place with a selection of ales to suit. After being offered a taste of those before we had to request it (big plus for that), I settled on a Tiger Bullion which was ok, but nothing to write home about. With the clock heading towards two, we decided to head back towards the ground, stopping of at the second Wetherspoon’s of the day, the Green Dragon. This is a slightly strange establishment, with an old, timber-framed part being attached to a bigger hall-type space. It was here that we found the bar and, much to my delight, the F1 qualifying. With Punk IPA once more purchased, I watched on as the Iceman secured 4th place. Decent stuff. Again, though, not much of note happened in here and we soon set off on our way out from the town towards Harrison Park. About 10 minutes later, we arrived at the far side of the ground, having to head round half of it to reach the turnstiles. £8 admission later (plus £1.50 programme from the kiosk next door) and we were into what is my 190th ground. As is becoming part and parcel now, it was straight to the bar with 30 minutes to kick-off. After deciding to have an impromptu passing match with a miniature ball, we eventually got this bit of childish “see ball, must kick ball” out of our system, we grabbed a table near the window where we could witness the early stages of the game. Magic. 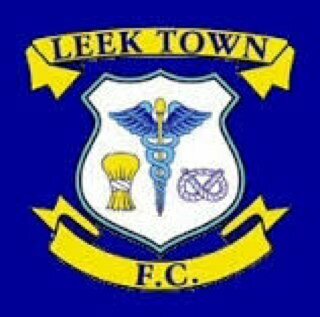 Leek Town FC was formed in 1946, though football was played in the town from 1876 at least, including an earlier Leek FC side who competed in the Combination during the 1890’s. However, the current club traces its roots from Leek Lowe Hamil, the team formed in 1946 (though it may have been earlier under a different name) and who won their first league, the Staffordshire County League, in 1949-’50 (possibly ’50-’51, very mysterious club this one), their third season in it. 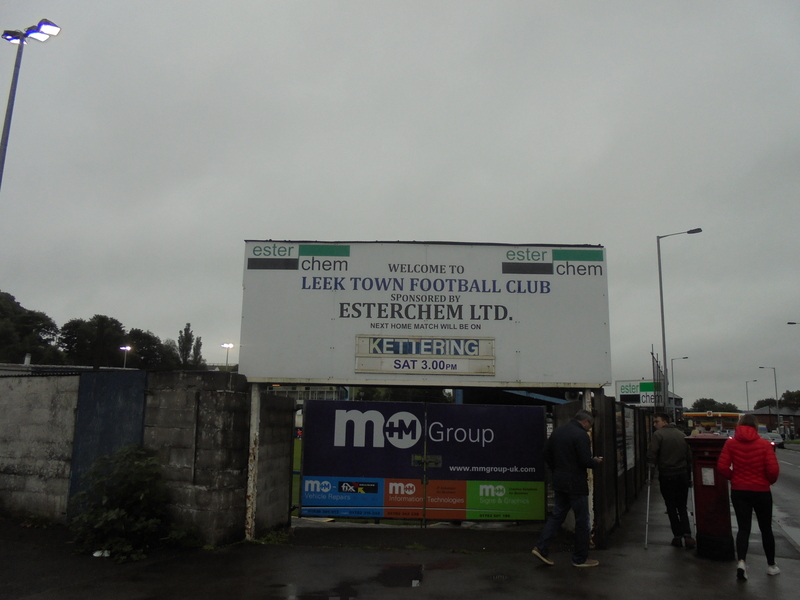 In 1951, the club switched to the Manchester League, where they adopted the Leek Town name. They won the title at the first attempt, switched to the Mid-Cheshire League immediately following their glory, but again only stayed for one year here, before switching into the Birmingham & District League for 1954. However, during the ’56-’57 season, Leek resigned citing financial issues, had a brief stay back in the Manchester League which was als plagued with monetary problems, before eventually returning back to the Staffs League. During the late 60’s & early 70’s, Leek were no strangers to silverware, seeing two titles in both the Staffs League & Manchester League (’72 & ’73) arrive. After the second Manchester League title, the club moved into the Cheshire County League, where they won the league at the second attempt (1974-’75). 1982 saw the league merge with the Lancashire Combination to form the North West Counties League, of which Leek became founder members, spending five mediocre years. However, in 1987, the club were selected to be a founder member of the Northern Premier League’s new Division 1 and won this in 1990 and with it promotion to the NPL Premier Division. They also reached that year’s FA Trophy final, beating Conference champions Darlington along the way, only to fall to Barrow, under the famed twin towers. ’94 saw Leek finish runners-up, but were refused promotion due to financial problems. To compound this, the club were moved to the Southern League, worsening the issues, but after the sole year here, Leek were allocated back to the NPL. 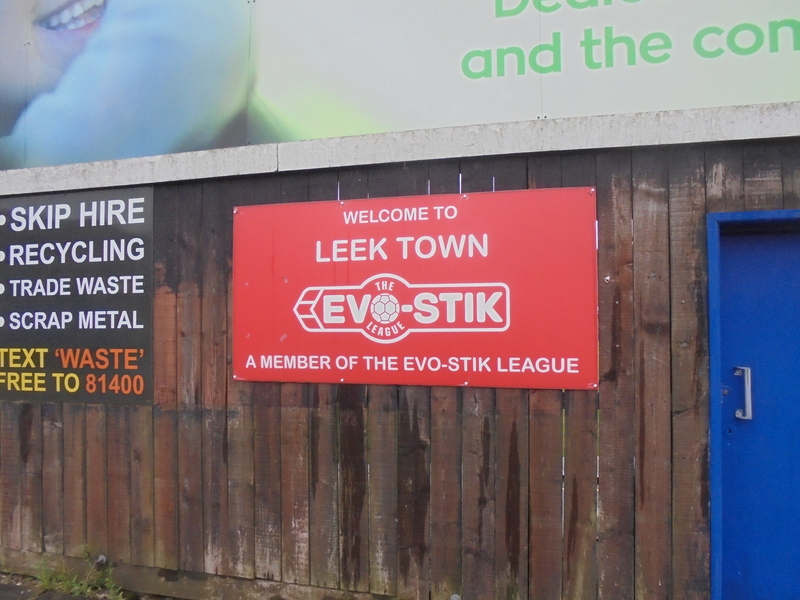 In 1997, Leek went one better and won the NPL Premier by ten clear points to attain promotion to the Conference, but only lasted two years of struggle, before dropping back. 2001 saw a further drop back into the NPL Division 1, but regained their place in the Premier Division in 2004, as a result of league restructuring and the creation of the Conference North. The club had to stave off a winding-up order in 2006 as the financial problems returned, but the club survived this setback and continued on. 2008 saw Leek relegated into the Division 1 South and have remained there to this day. 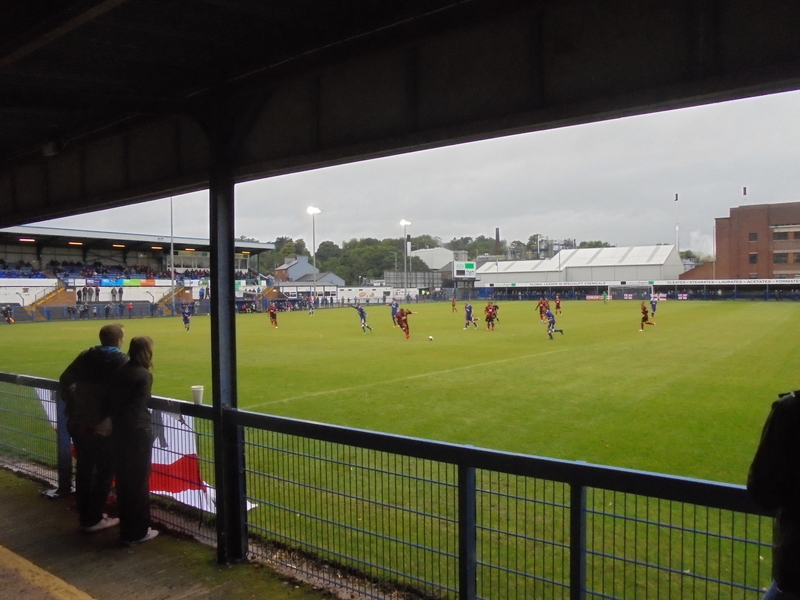 The closest the club have come to getting back into the Premier Division of the NPL was in 2012, when the Blues lost out to Ilkeston FC in the play-off final. Last season, the club finished up in a respectable 8th place in the NPL Division One South table. The game got underway and was played at a good pace. I was more distracted by the fact that a usual Football Manager signing of mine, Spencer Weir-Daley, was in the Kettering side and he was looking quite dangerous early on. But, it was his fellow forward, Rene Howe, who’d open the scoring after 23 minutes, his header dropping into the bottom corner. 0-1 to the Poppies. 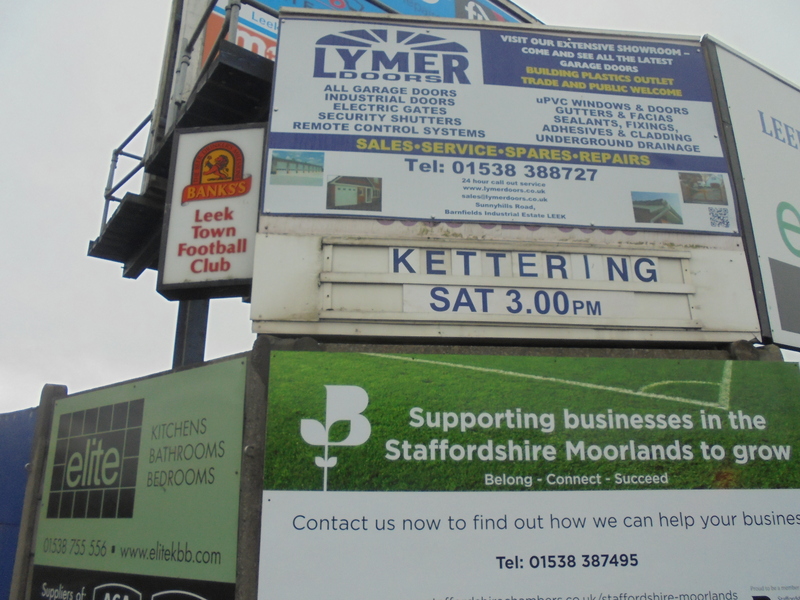 This goal seemed to give Kettering the impetus and they looked more likely to add a second than Leek did to draw level. They should have done so just after I’d purchased my food for the day, a fine chips, peas and curry, but Leek ‘keeper Chris Martin (neither the Coldplay frontman nor ex-New Zealand bowler) pulled off a good stop with his legs to keep his side in the game. 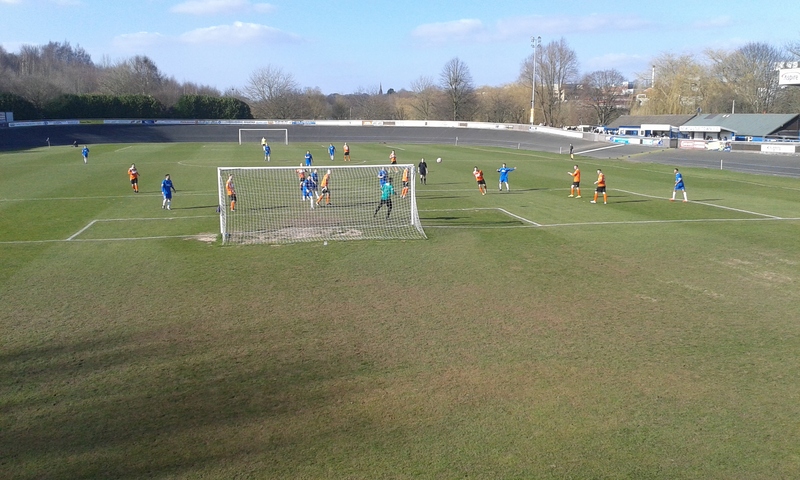 This save proved even more important as Leek drew level five minutes before the break, Jordan Johnson whipping a fine free-kick around the wall and into the bottom corner. His celebration proved just how much he enjoyed that strike as he pulled out the ever-popular knee-slide. Only problem was, he chose the almost completely vacant open terraced area to do it in front of. But, it’s the goal that counts and the sides went in at one-a-piece. The timing of the strike was made better, though, by the fact I stated just prior to it “Let’s have a picture of food & a goal. Voila, Johnson delivered. Top man. The second half began with Leek almost forcing an equaliser after putting the visiting defence under pressure and almost fashioning a chance, only for the goalkeeper to be alert enough to narrow the angle and the header went wide of the mark. 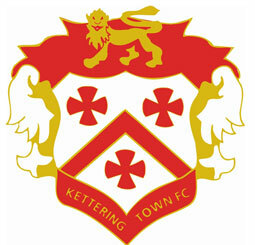 Kettering recovered from their slow start to the second period and went ahead for the second time in the game, with Nathan Hick’s daisy-cutter skimming into the bottom left-hand corner from 20+ yards. 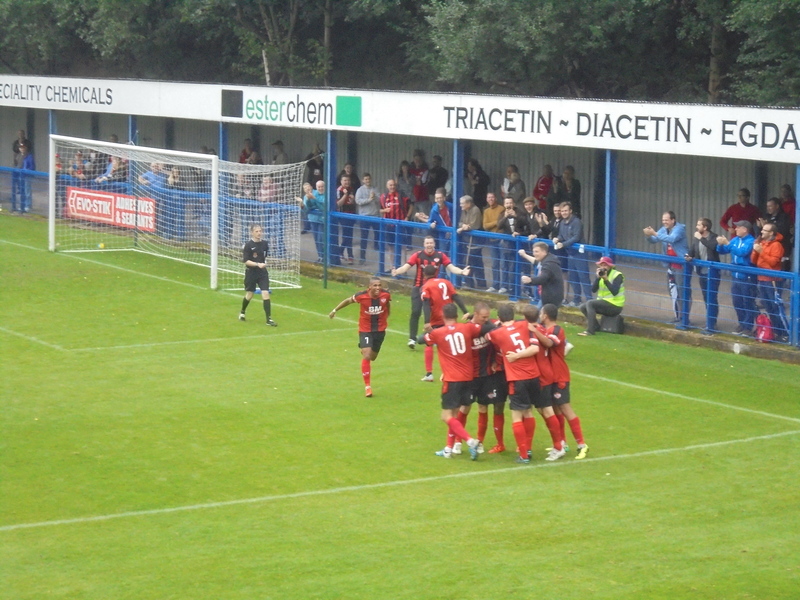 Despite Weir-Daley being given the goal initially by the PA man, Hicks was eventually given his due. 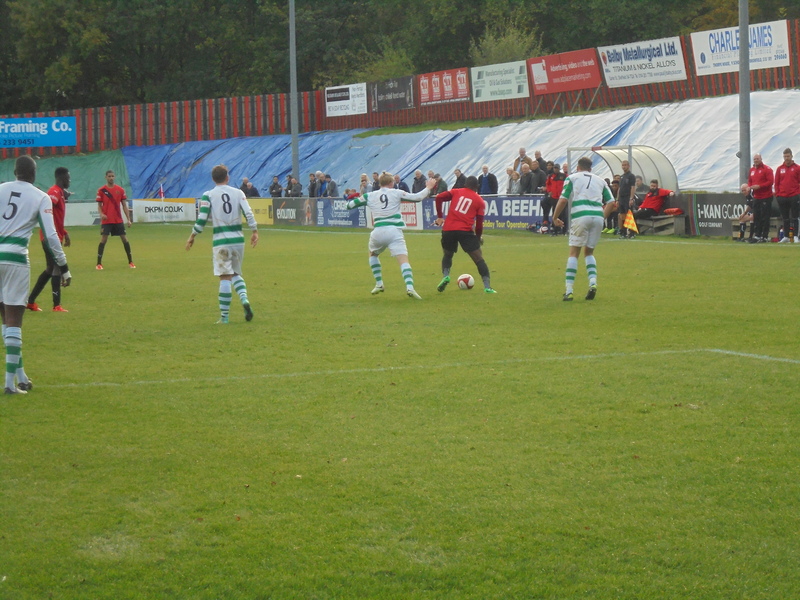 The 1-2 lead only lasted for 10 minutes, though, as Leek again found a leveller. This time, a quick move down the flank saw a ball into the area collected by Tim Grice and he slotted home calmly to make it all to play for once more. Both sides were going for the win, with neither wanting to replay the game in midweek for obvious reasons, but it was the Poppies who were having the better of it late on and as we entered stoppage time a pull in the area at a corner meant the referee was pointing to the spot. Up stepped sub Aaron O’Connor, but he fired the spot-kick wide of Martin’s left upright. It was a poor penalty, but as fate would have it O’Connor went from zero-to-hero within a minute as, from the very next attack, the ball fell to O’Connor on the edge of the box. He took his time and smashed a low shot which creeped under Martin and into the net sparking crazy scenes within the travelling support behind the goal with no-one entering the pitch. No-one. Absolutely no-one at all. 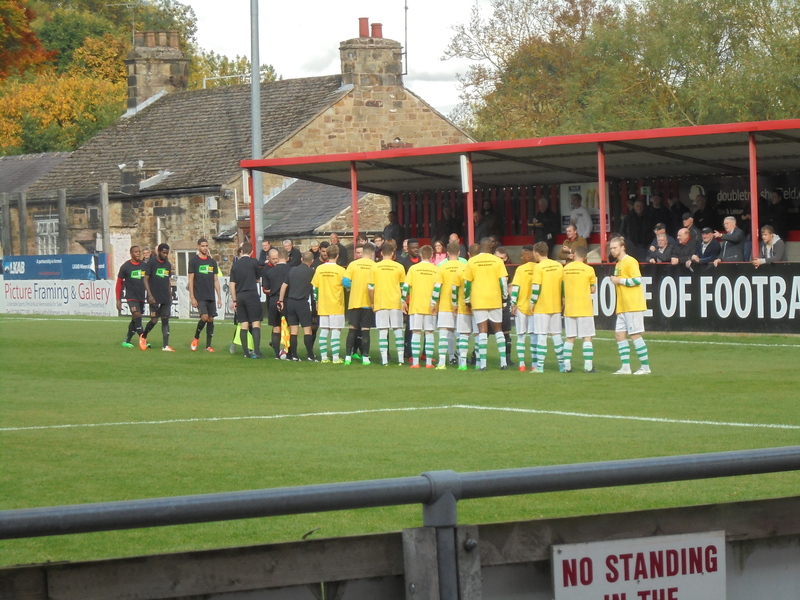 Leek’s assistant manager was sent off in the aftermath, as his side fell just short against their higher-level opponents. 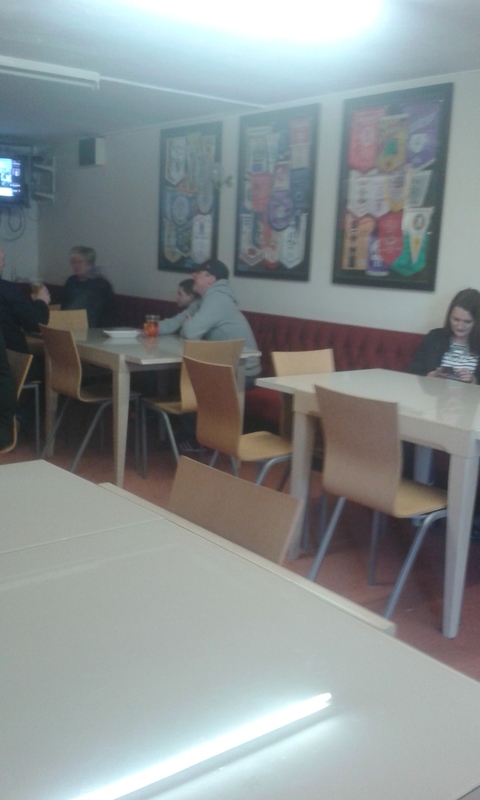 We looked suspiciously like away fans in the main stand, as we celebrated a game settled on the day, as attending the replay was a bit unlikely…..
With the final whistle blew, we quickly exited the ground and headed for the White Lion pub (as to not show any favouritism to Lions of any sort). 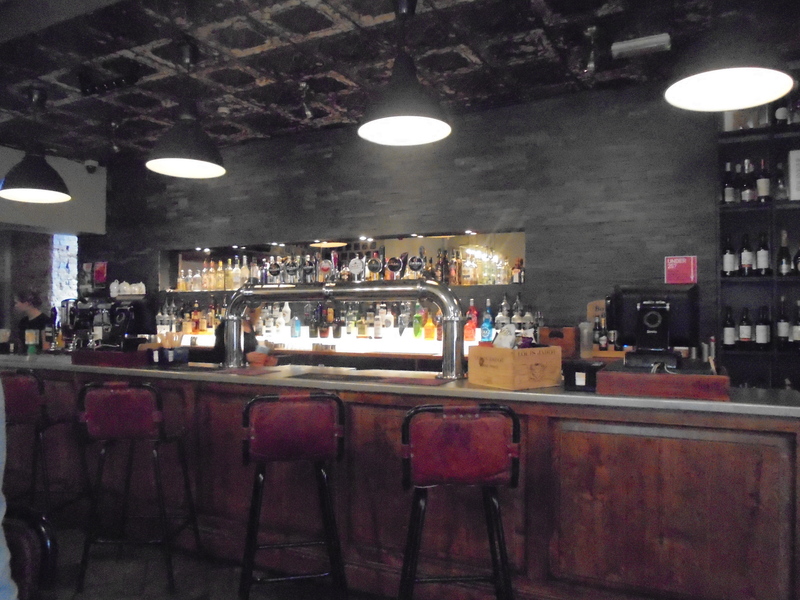 Being the first ones in is always awkward, as it appeared to be more of a restaurant-pub than a pure pub. Luckily, though, we were soon joined by Kettering fans Chris and Dave who seemed a bit disappointed that none of their numbers had shared their fine decision to have a celebratory one here. Talk, as usual, turned to grounds and famed Kettering games in the past, with Paul’s favourite being the Leeds Utd game which he seemed pleased to be able to talk about, having mentioned it a couple of times earlier in the day, but I have no real recollection of it, so couldn’t share the enthusiasm! Also, the trivia we were given was that Kettering are the FA Cup’s highest scorers, over the years, which was something none of us were aware of, but was also stated in the programme, so that is good to know. Eventually, it was time for us to head up the road slightly for our bus back, so we bid goodbye to Chris and Dave and headed up the road, deciding we just had time for a quick one in the Dyers Arms. After having some issues finding the stop following our drink (signs aren’t utilised it seems), the locals told us that the road light doubles as the stop and so we trusted their word with bated breath, but knowing the Leek locals would be trustworthy, right? Of course they were, if you thought otherwise then shame! The bus journey back was a strange one with a Geordie Liverpool fan talking to a Cumbrian Manchester United fan while we, as natives of both respective club’s cities decided it was our right to involve ourselves in the conversation! 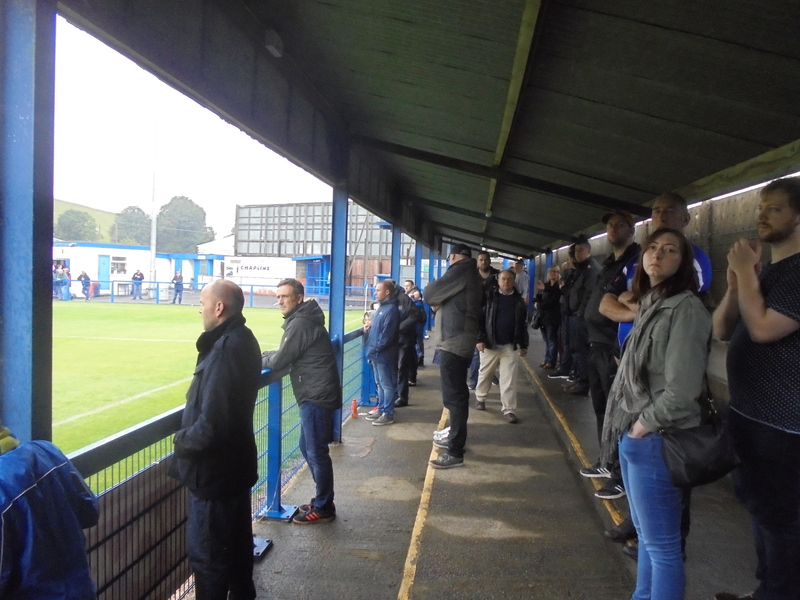 The United fan’s wide, though, had only come out for the pub crawl with her husband and wasn’t looking too appreciative of the football talk, but it certainly helped to pass the time for us as we were soon passing by Moss Rose and into Macc town once again. With an hour to our train back to Manchester, we decided the Queen’s Arms would be the best place for a quick stop, with a honey beer being a good accompaniment. Paul’s celebrity non-league manager identifying-eye came into its own as her declared ” That’s Garry Hill!” Indeed, the Woking coat-clad Hill and his assistant were sat at the bar doing their own side’s post-mortem after their defeat to Macclesfield earlier in the day. As such, he wasn’t too talkative, as is understandable, but still gave a few minutes of his time in discussion, though I think he wanted us to go away, which we did soon enough! A fittingly named drink after today’s game. After a quick trip to the station for a non-existent train, we spotted the banished Woking side populating the waiting room on the far side. Eventually, our train pulled in too and off we set for a final stop off in Manchester, namely the legendary Peveril of the Peak pub. What we didn’t know was that our fierce table football rivalry would be renewed in here, with the result sadly slipping my mind (that’s the truth…), but the real stars of the show were the Saharas nuts. Glorious! 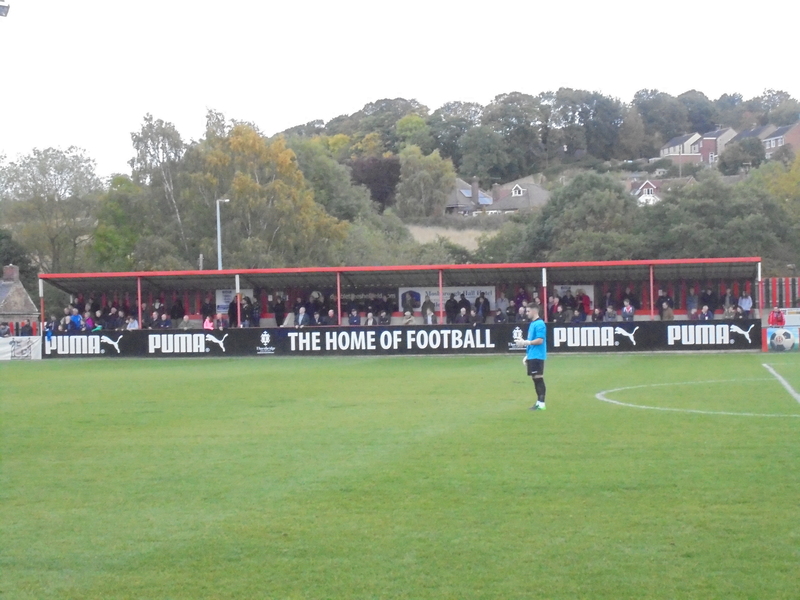 Previously on this blog, I’ve stated about overdue trips to clubs before, but none can outdo Sheffield FC for being such. 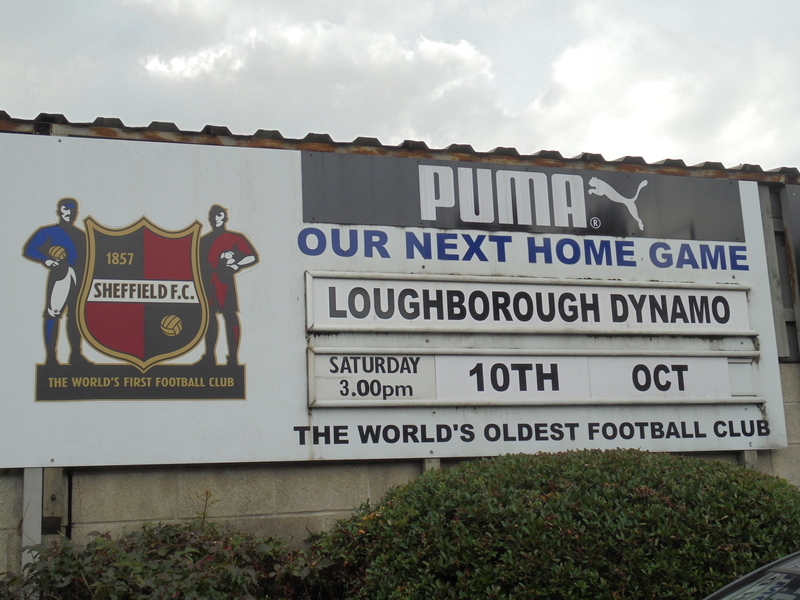 Sheffield have been a club that have long been on both myself and my groundhopping partner-in-chief Dan’s wishlists and after being denied a trip there by some extreme weather some 18 months or so prior to this, today the trip to the north Derbyshire town of Dronfield was finally on. The oldest football club in the world was finally to be ventured to by the equally famous Manchopper. I jest, of course…. So, I arrived into Manchester Oxford Road station at around 11 am, with more than enough time to catch the connection onwards to Sheffield. 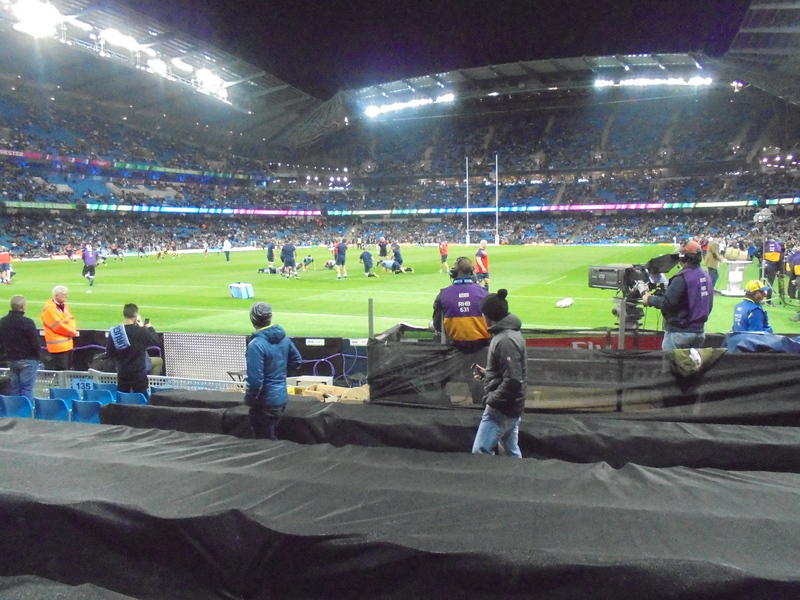 Soon, I was joined by Dan, who the night previous, had acquired some Rugby World Cup tickets for the game at the Etihad between England and the mighty Uruguay. Of course, I’m not huge rugby aficionado, but I easily prefer Union to League. The latter is just a borefest to me, but that’s just me and my opinion, and I know I’m in the minority in the North! Alas, despite the half-hour early arrival at MCO station, the train was delayed due to a door issue and when it did finally arrive, we were told we couldn’t board it due to the problem and that was that. CANCELLED. 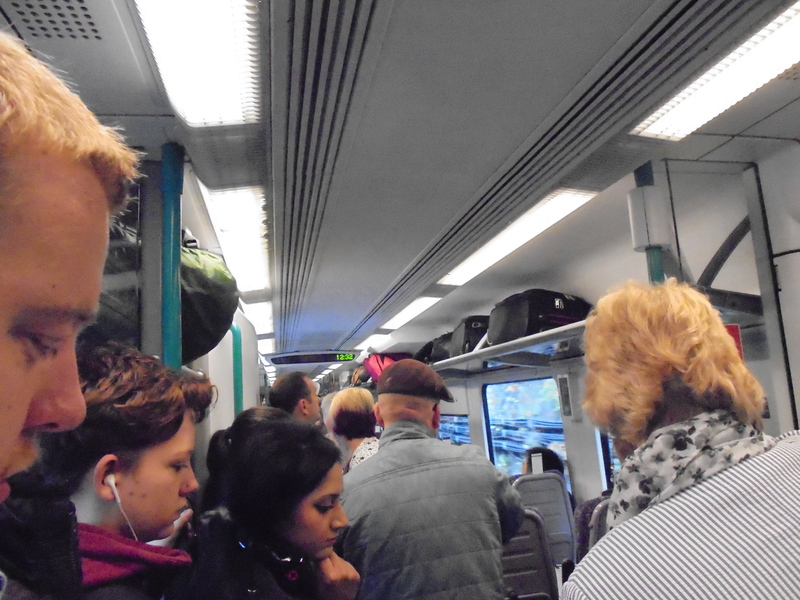 So, onwards it was to Piccadilly for the alternative service offered by Trans-Pennine Express. Hopefully, they were to be more reliable than there East Midland Trains counterparts. Good news is, they were as they arrived. Bad news was, due to the cancellation, we were all packed into a sardine tin that, if there had been an accident, would have certainly caused many deaths. I love our rail network. Anyway, with yet another rail-related rant completed on these pages, it was off to the dark-side of the Pennines, Yorkshire. But only briefly, as a quick connection would see us head out of the worse-Rose County and to Chesterfield. But first, it was a battle to get off the train in Sheffield and was a welcome relief to have oxygen once again filling the air and not recycled breath, following a 55-minute experience of rubbing up against people you’d not usually welcome rubbing up against, nor would they welcome you doing it either. However, it must be heaven for a groper! 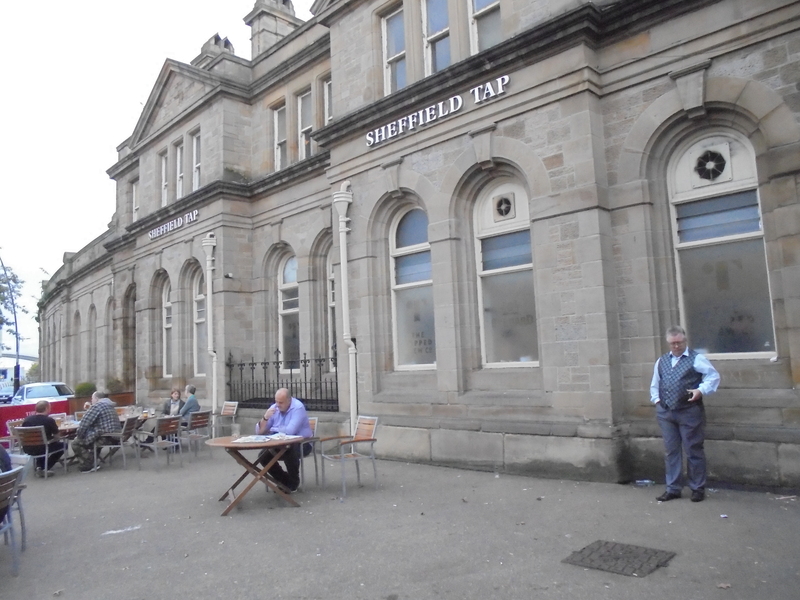 Upon arrival, the planned stop in the much-loved Sheffield Tap would be set aside, as a quicker trip to Dronfield was worked out that would give us a further 15 minutes in the town. After arriving over an hour later than planned, small graces were welcome. 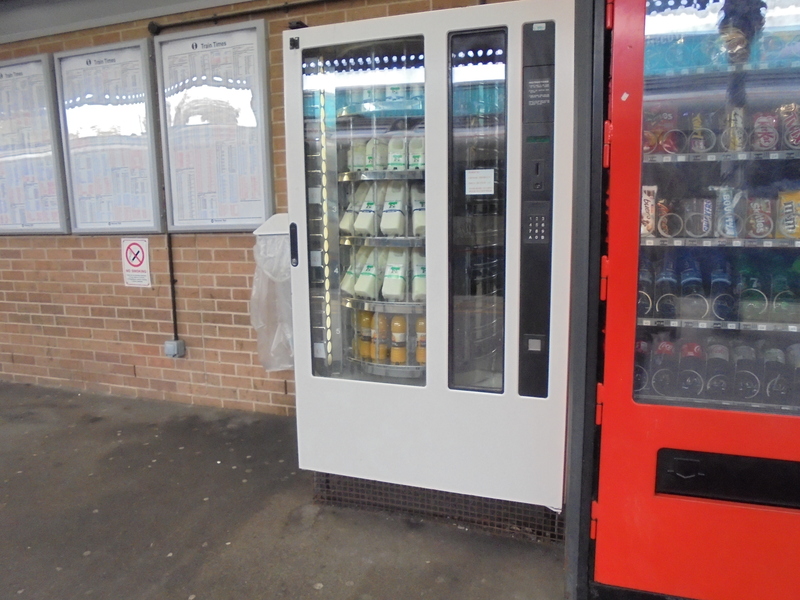 So, into and out of Chesterfield we went, with the highlight being the Dronfield-bound platform’s Milk-vending machine. However, as I sadi to Dan at the time, I am curious to who stands on the platform and thinks, “I really could do with a pint of milk right now”. There must be some of you out there to warrant it and here it is in all its glory…. So, Dronfield was finally arrived in at shortly after quarter-to-two and headings were made straight for the Coach & Horses pub outside the ground, which effectively acts as the club’s clubhouse. This is probably of no surprise, as the ground is known as the Coach & Horses Ground, just as the Butcher’s Arms and others are named after their public house neighbours. Of course, the Butcher’s is no more but, happily, the Coach is in much ruder health and was a buzzing hive of activity leading up to kick-off, with people with all sorts of sporting paraphernalia inside, including one young “football hipster” wearing a Schalke 04 shirt. After Dan had “fainted” on the grass verge near the ground due to the “high levels of intensity” (if you don’t know, we tend to give levels of intensity too things, with Sheffield being high on the list), the first beers of the day had been purchased in the warm, welcoming surroundings of the Coach & Horses. 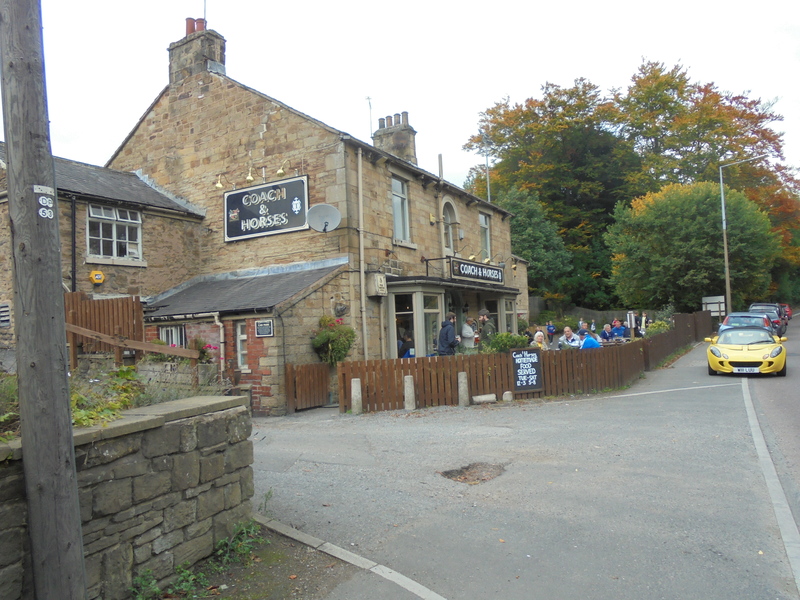 Sadly, due to our late arrival, we didn’t have more than 20-minues to enjoy the pub and we were soon heading up the small rise to the left of the pub and through the car park to the “home of football”. 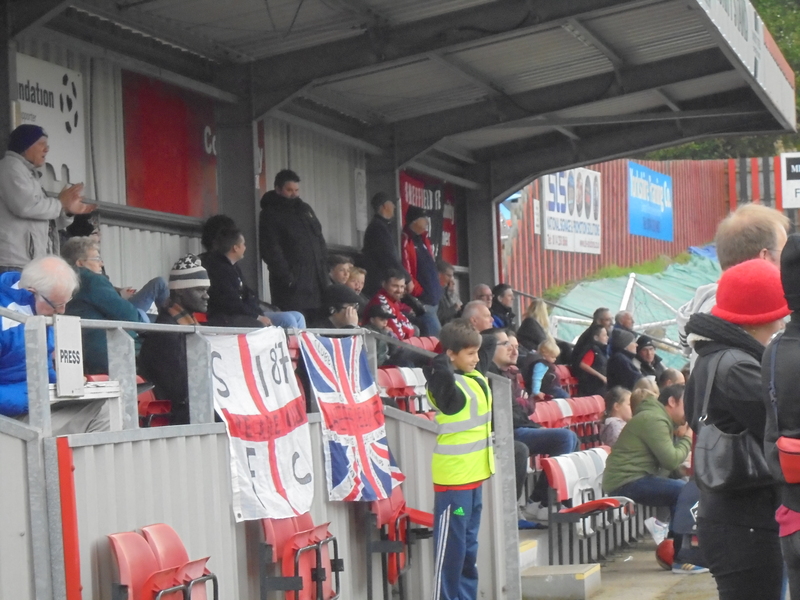 Due to it being Non-League Day, the club were offering those with Premier League season tickets £1 entry. This is where one of my biggest bugbears comes in. Though I understand the reasoning behind it, I do feel that it takes the support of those week-in, week-out supporters of this level for granted. 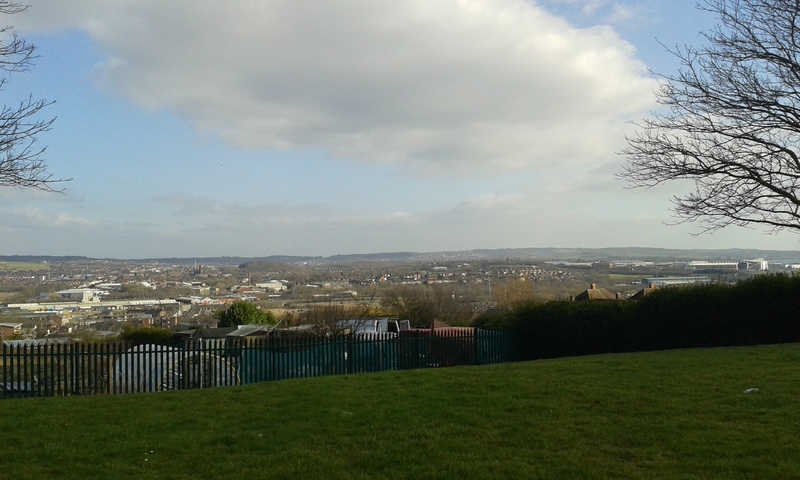 Not that I’m singling out Sheffield, I’m not, but I just can’t see how it’s fair. 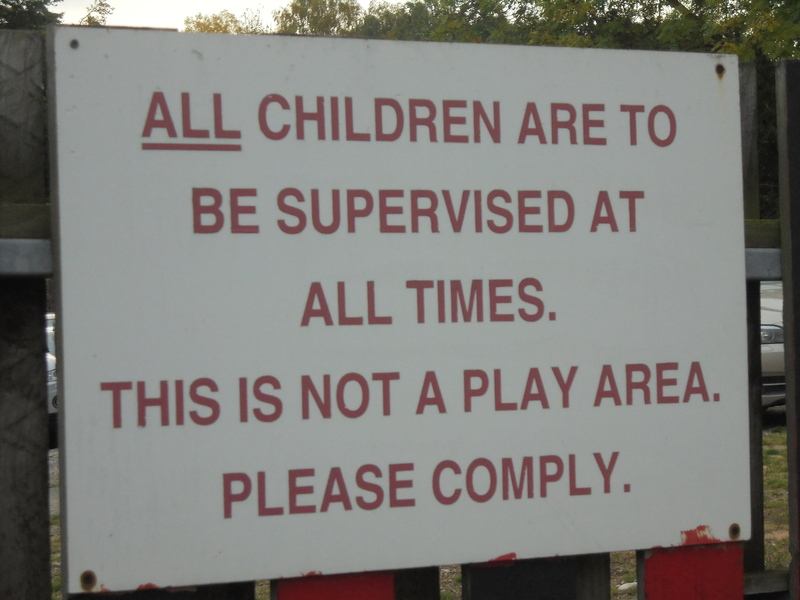 One rule for all, perhaps? There must be better ways. So, after paying my £8 entrance fee, I was into the Coach & Horses ground, before doing a U-turn when through the other side and heading back to the turnstiles for a “bible”. A further £2 was taken, but that is a very fair price, for what is a very good read. 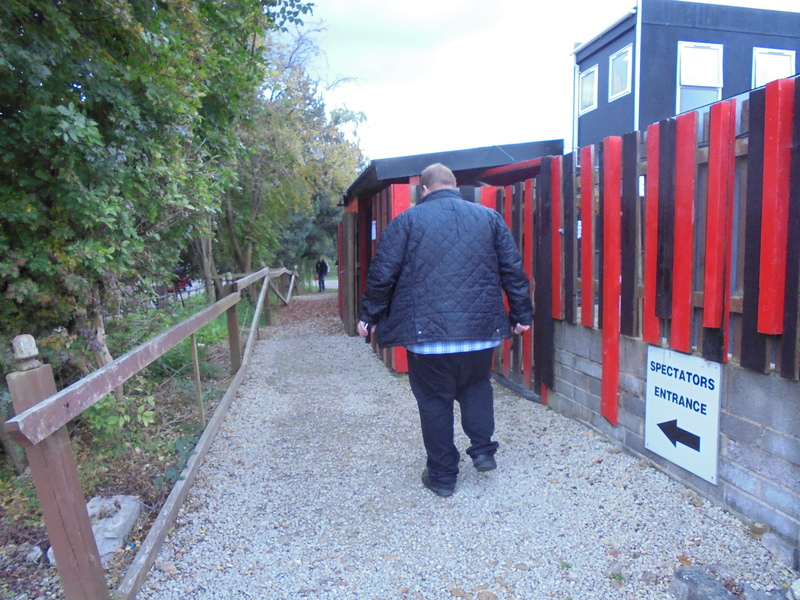 Dan headed to the food hut for a pie, whilst I headed off for some pre-match ground browsing. The C&H (as it will be referred to as such from now on) is a mix of old and new, with the stands both being of relatively new-build, especially the seating structure behind the goal at the end from which you enter. 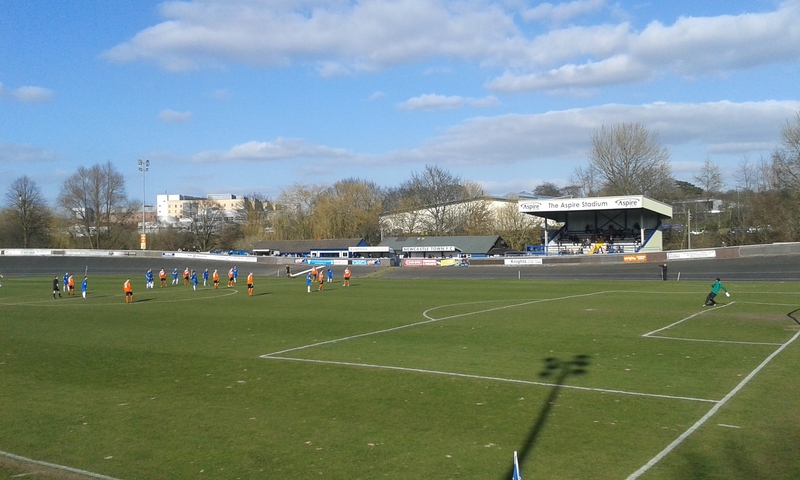 Down the right hand side is a covered, raised terracing area , with the far end open, hard standing, complete with a large manual scoreboard. The far side is further hard standing, with the dugouts here too, but also here is where the ground loses points. 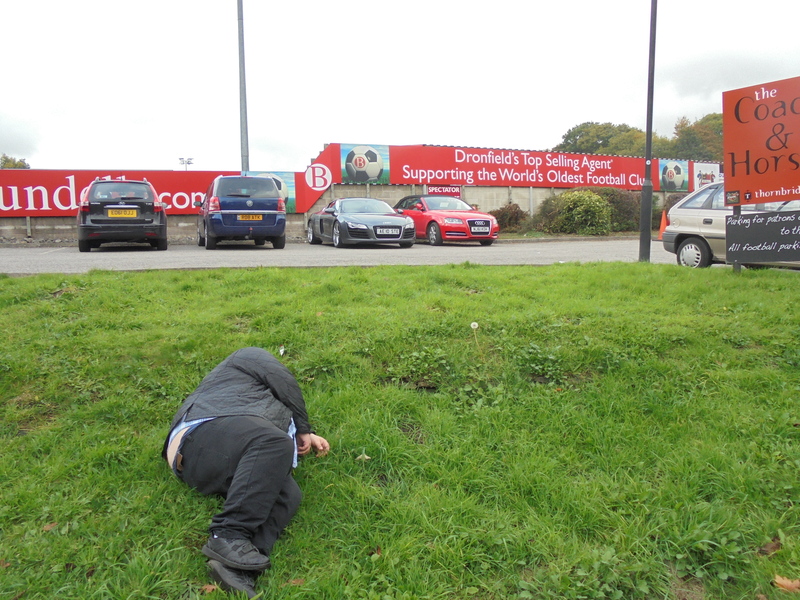 It has a large blue tarpaulin covering a grassy mound, complete with FIFA logo. Tsk. Not that it Blatters….With that terrible FIFA related “joke” thankfully behind us, it’s time to have a look into the, only slightly lengthy, history of the original Club…. 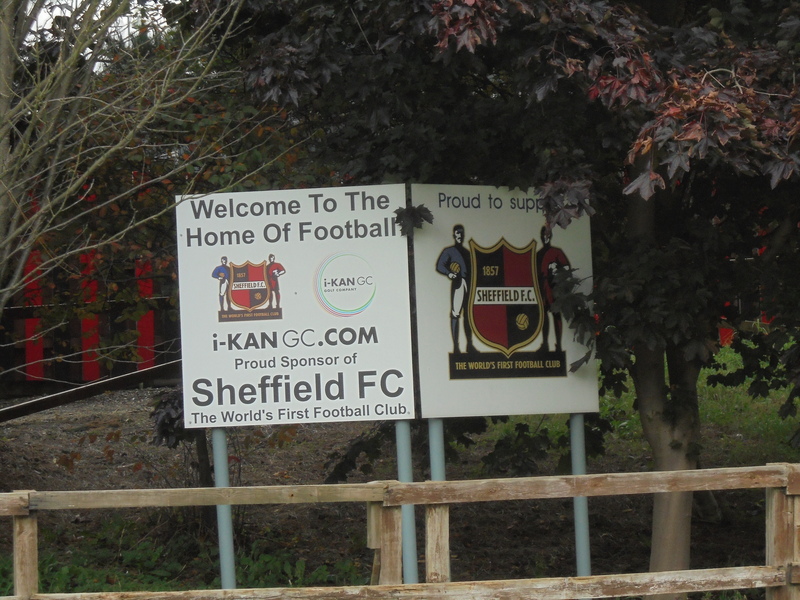 After Sheffield Crocket Club had informal kick-abouts as far back as 1855, it wasn’t until two years that a formal meeting would take place regarding the formation of Sheffield FC. They originally played games amongst club members, taking on the titles of “Married vs Singles” & “Professionals vs The Rest”. (Thanks, Wikipedia!). Soon, members Nathaniel Creswick and William Prest were responsible for creating the club’s rules, which became referred to as the Sheffield Rules, the first ever official rules for football, which were later adopted by the Sheffield FA upon its formation in 1867. Following Hallam’s formation in 1860, the two contested their first local derby fixture and by 1862, 15 clubs were in situ around Sheffield. They became members of the FA in 1863, but continued to use their own rules, but did play outside of Sheffield for the first time in 1865, when they played Nottingham under Nottingham-rules, meaning an 18-a-side game. 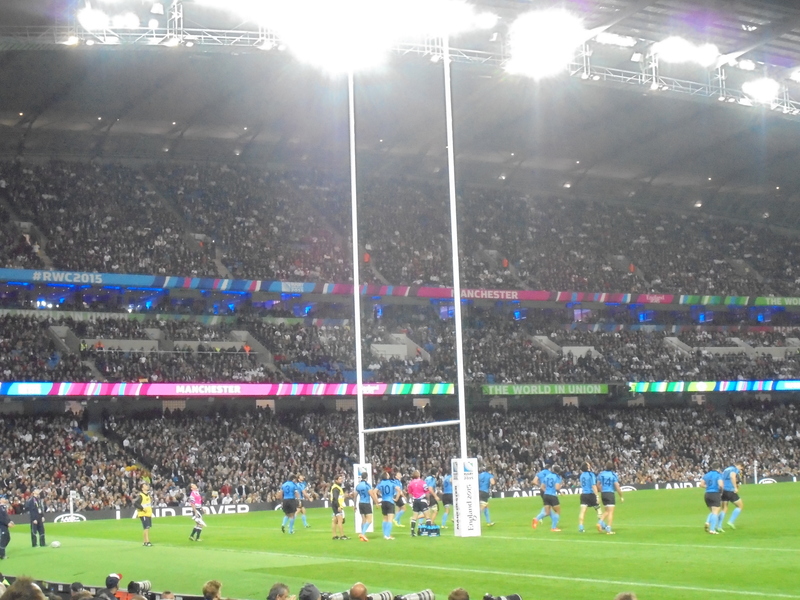 The club had also decided to only play clubs outside of Sheffield as they sought more of a challenge, and this saw them play in Battersea against a London side. London won by two-goals and four touchdowns to nil! After playing Shropshire Wanderers in the club’s first ever FA Cup tie in 1873, the only tie to be decided by a coin toss, Sheffield finally adopted the FA rules in 1878, following the FA’s reluctance to sanction matches involving Sheffield. In opposition to the club not wishing to play Sheffield-based sides, Thursday Wanderers were formed, made up of players wishing to play in the Sheffield Challenge Cup, but the Wanderers lasted just three years, but did win the cup in their final year. Following professionalism, the club fell into decline, and following a campaign by the staunch-amateur Club for an amateur’s only competition, the FA Amateur Cup was formed, that Club would go on to win in 1904. Their first league was the Midland league, joined and founded in 1889, but left after just a season. Club also founded the Yorkshire League in 1898, but again only competed in one season. 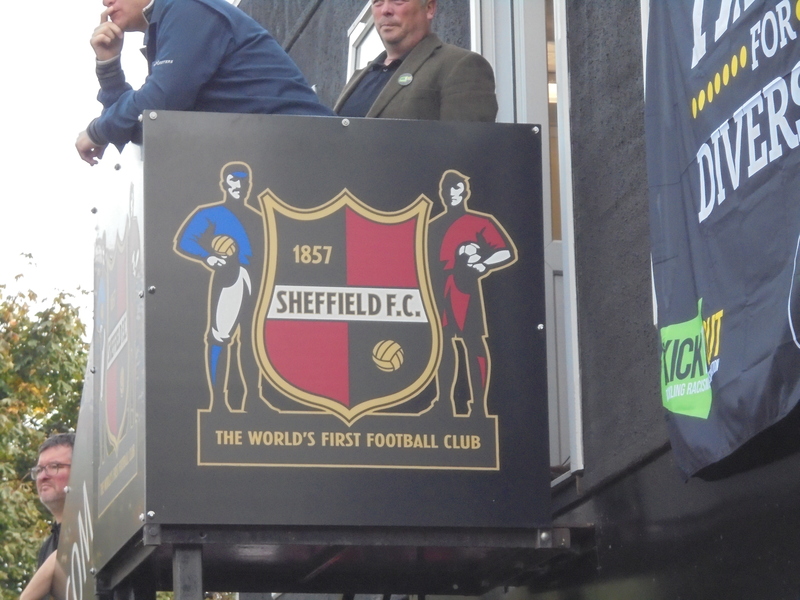 After largely competing in the local leagues from 1900, Club eventually joined the Sheffield Association League in 1925. In 1949, 50 years after last competing in it, Club rejoined the Yorkshire League. Three years later, they were promoted to Division 1,but were relegated after two seasons, but bounced back in their centenary year, 1957. 1961 saw Club relegated again, taking six years to reach Division 1 again, before continuing their yo-yo existence wih another drop after one season, and were relegated to Divison Three in 1970, where they remained until 1976,but by 1978, they were back in the Division 1. The same season as their promotion, Club played at Wembley in the FA Vase Final, drawing 1-1 with the “should be an Irish place” Billericay Town, before eventually losing the replay in Nottingham. After the merger of the Midland and Yorkshire Leagues to form the Northern Counties East League, Club were placed in Division 1 South. After reassignments and restructure, Club won Division 1, but spent just one year in the top flight, before being relegated on ground grading, but conformed and won the league again immediately. After a first ever Sheffield & Hallamshire Cup win in ’94 (since won four further times) and a pair of NCEL Cups, the club won promotion to the Northern Premier League in their 150th year, 2007, as runners-up. After celebratory games against Internazionale and Ajax, the former played in front of Pele and including the likes of Mario Balotelli and Marco Materazzi. Club have reached the play-offs of the Division 1 South on three occasions, to no avail and last season finished up in 15th place. Back to today’s game and it was some sort of celebration of the “Kick It Out” movement and anti-discrimination in general, with free badges etc. 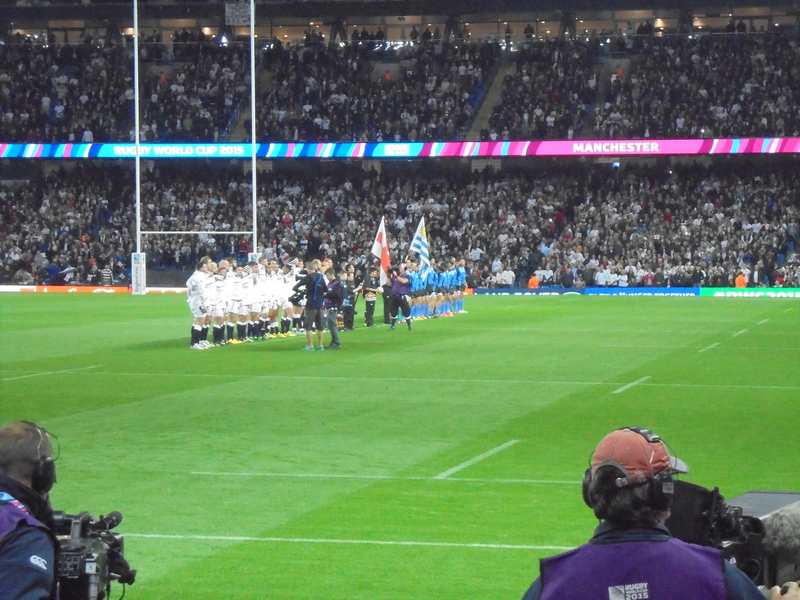 being handed out and a flag being paraded prior to kick-off. Soon enough, this was all through and Club and visitors, Loughborough Dynamo, made their way to the field to undertake the pre-match pleasantries and formalities. With these sorted and out of the way, we were all set at the “Home Of Football”. It all gets too much for me. After we’d taken our seats in the stand behind the goal Dynamo were attacking during the first period we found ourselves next to a group of fans ranging from 7 to 77, with the elder fans coming up with some songs and hitting the rear of the stand to the beat. 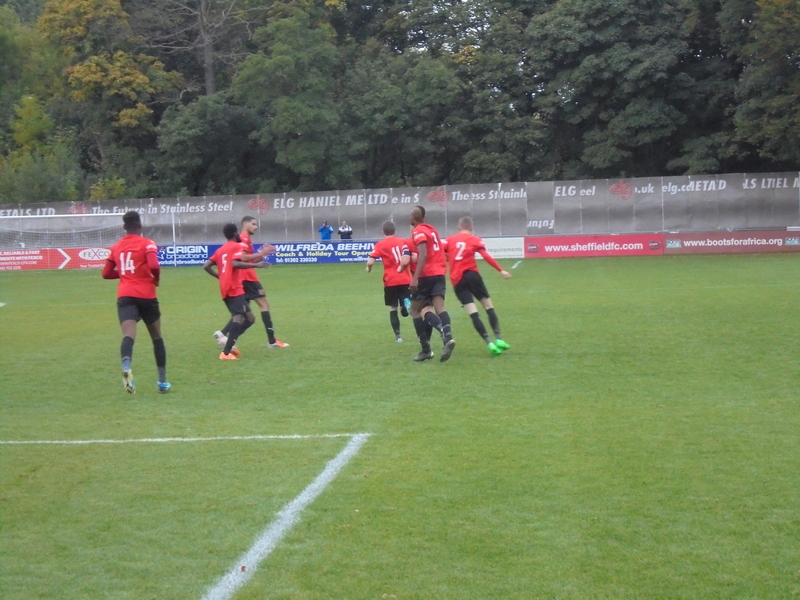 Loughborough made all the early running and it was no surprise, therefore, when they did eventually take the lead. After missing a great chance moments earlier, Dynamo skipper Rob Norris made amends, nodding in a header at the near post from a whipped in cross from the left. After Club had recovered from their poor start, they fashioned a couple of long range efforts, but not too much to speak of, while the visitors’ striker, sporting that short ponytail look that’s in vogue for some reason, gained less friends by the minute on the terraces as they adjudged him to be going down far too easily on a number of occasions and thus, when he was booked himself for a foul, the cheers went up and would have been confused for a goal had someone heard from outside. As Dan and I went on a wander of the ground, we ended up in conversation with the Dynamo goalkeeper, who told us about his many previous visits to the ground whilst in the colours of Rainworth (apparently pronounced Rennerth) amongst others. He also mentioned that he usually gets beaten 4-0 here, so this was a far better day so far for him. But, when I suggested this to him, he warned that his Dynamo team tend to tire as the game goes on and he wasn’t “counting his chickens yet”. 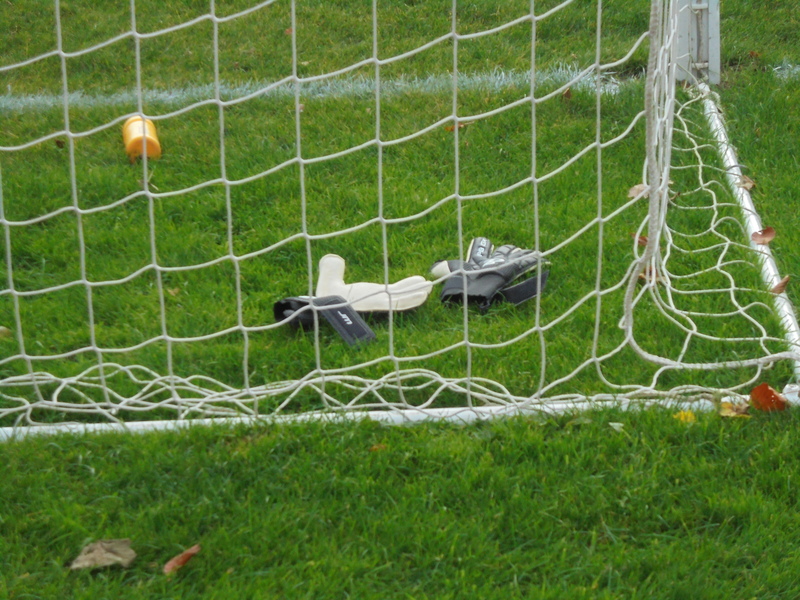 Leaving the ‘keeper to his concentration for the rest of the game, we went off on our way, just after this happened…. Loughborough doubled their lead. Norris showed tenacity to pounce upon a loose ball and after seeing his initial effort smothered, he recovered to round GK Tom Dunn, and slot into the empty net. Dynamo still had time to strike the post before the interval, though the effort appeared to be covered, left somewhat by a confident Dunn, and the sides went in at the break with the home side about to receive a bollocking from manager Andy Kiwomya, you’d have imagined! As for me, it was to the food hut, where a Chicken Bali pie was purchased for (I think) £2. It was your standard Pukka offering, nothing special, but decent nonetheless. Before long, the sides had re-entered the pitch and if you wanted the epitome of a game of two halves, then this one was just that. Sheffield dominated this half, just as the visitors had the first. Joe McCormack, the Dynamo GK had to pull off a decent couple of saves to keep his side’s two goal lead intact, but was helpless to deny James Gregory’s fizzing drive from the angle of the box, which flew into the top corner. 2-1, game on! Club’s Bruno Holden then headed narrowly wide of the target soon after the goal, but eventually McCormack’s prophetic words came to fruition, when the ball was only half-cleared out to Club sub Temi Raheem. The #15 steadied himself, before lofting a measured chip/shot over McCormack and into the top rightt-hand corner. A tremendous effort and it looked like Club would likely go on to win the game from here, but it never really carried on that way as Dynamo appeared to show resolve to hold out for the draw. In fact it was Dynamo who had the best chance to win it in stoppage time, when Steve Hart’s drive from close range was well kept out by Dunn. 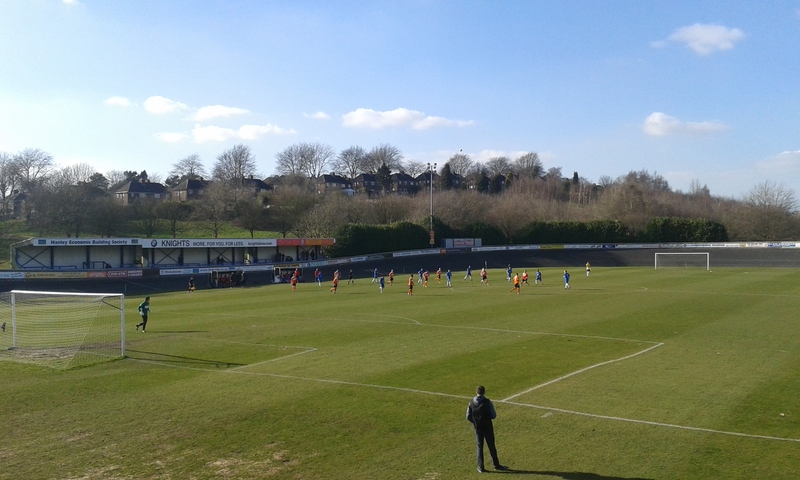 So, 2-2 was the final score, as the ref brought the fluctuating game to a close and a fair point for both sides. Dan and I had a cab waiting for us to take us into Sheffield, with the cabbie seemingly perplexed by what we were doing in Dronfield watching this game in the first place. 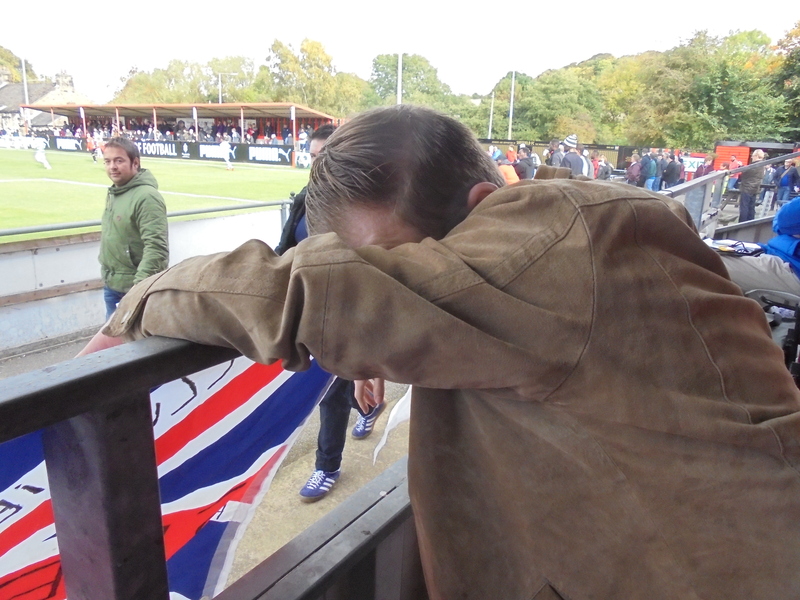 He thought he’d grasped it after deciding we’d come to watch the visiting side, but when we said it was Loughborough and not a Manchester side, he was dumbfounded. 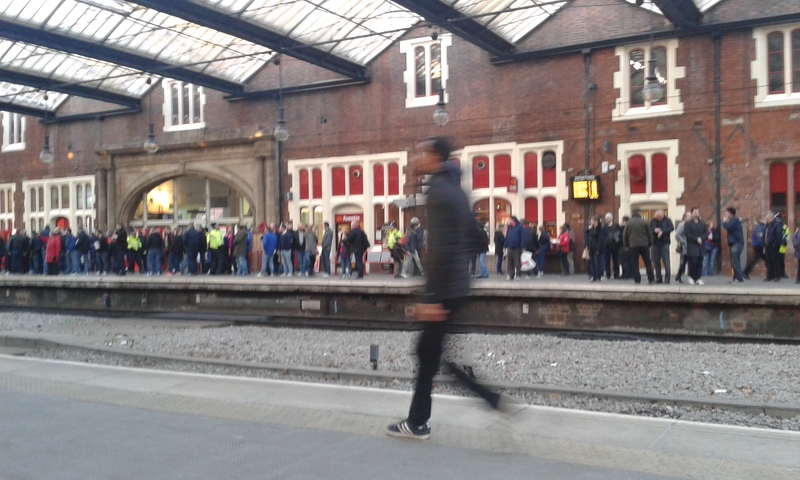 Despite this, he beat the Blades traffic leaving Bramall Lane, getting us to Sheffield Station with half-an-hour to spare, meaning a brief stop in the Tap would now have to happen. Shame. Oh, and if you need a cab from the C&H, City Taxis are the ones. See, advertising boards at non-league ground pay dividends! After a quick stop in the Tap , including Dan informing a guy “we’d” drew 2-2, but our stranger deciding “we” was Rochdale, then quizzing him on Dale matters, we left the crowded pub for the platform and the train back to Piccadilly and the Etihad for the Rugby World Cup crunch tie….oh, yeah that’s right…Ah well, still. 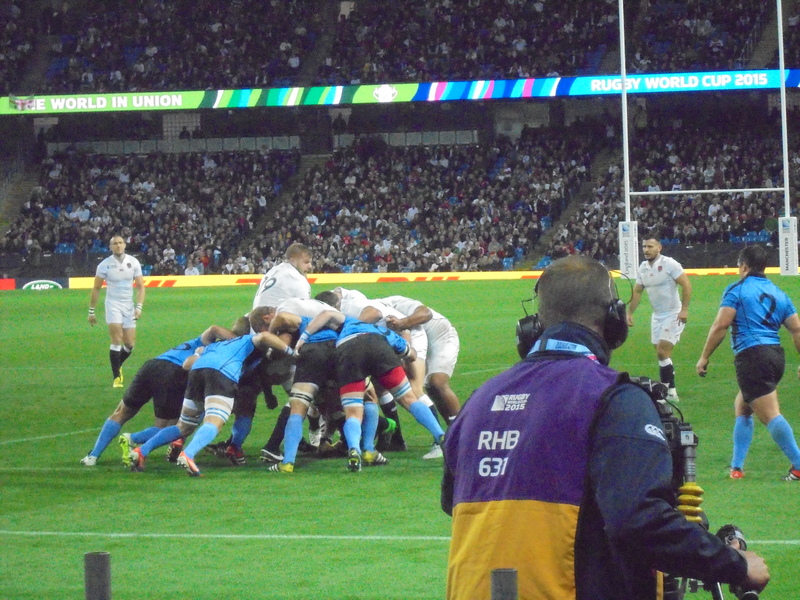 It was to be my first live rugby experience and in international form, even if one of them was the minnows of the South American nation, Uruguay. 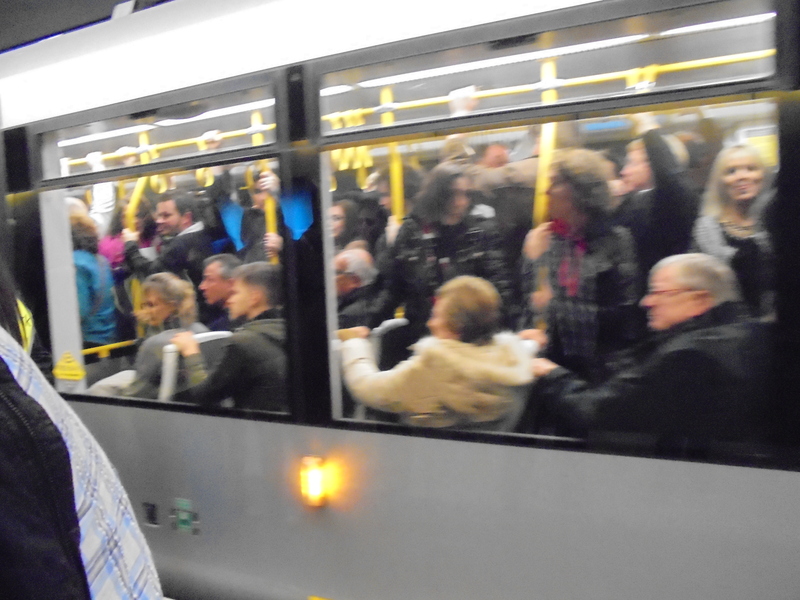 After being toilet doorman on the train for some reason, as the doors kept breaking down, we were getting down to the Metrolink station after our arrival back in Manchester and getting on a Ashton-bound tram. Well, we were to, but they were more sardine tins and we eventually got on one that the Met had sourced from somewhere that was empty. Probably after my ingenious heckle that public transport companies didn’t do common sense, after two terminated in front of us and left empty. Still, we eventually managed to leave and arrived in the Etihad to find a guy selling half/half scarves at the top of the steps from the stop and bemoaning his luck in doing so: “This is what happens when you don’t listen in school”. 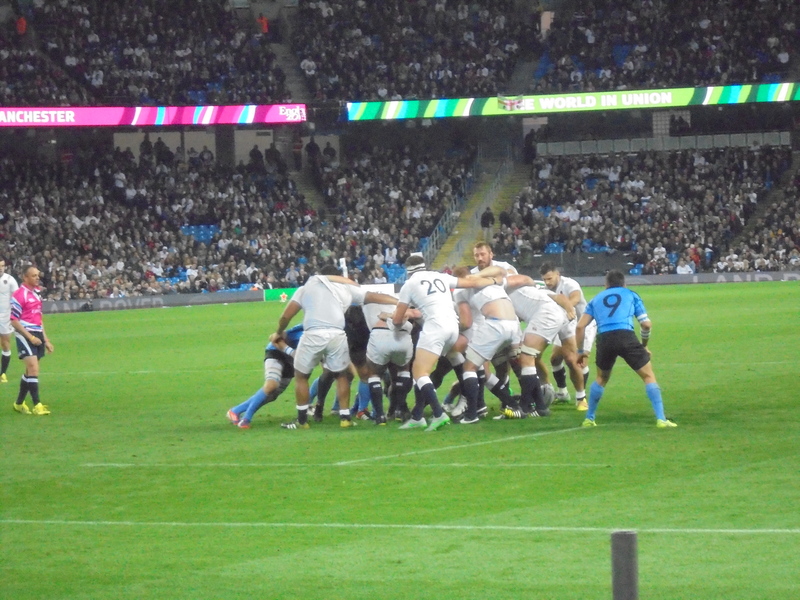 Before long, we’d arrived in our seats in the front row, North Stand, on the touchline behind the posts at the Etihad, and thus saw the only Uruguayan points of the game at close quarters. 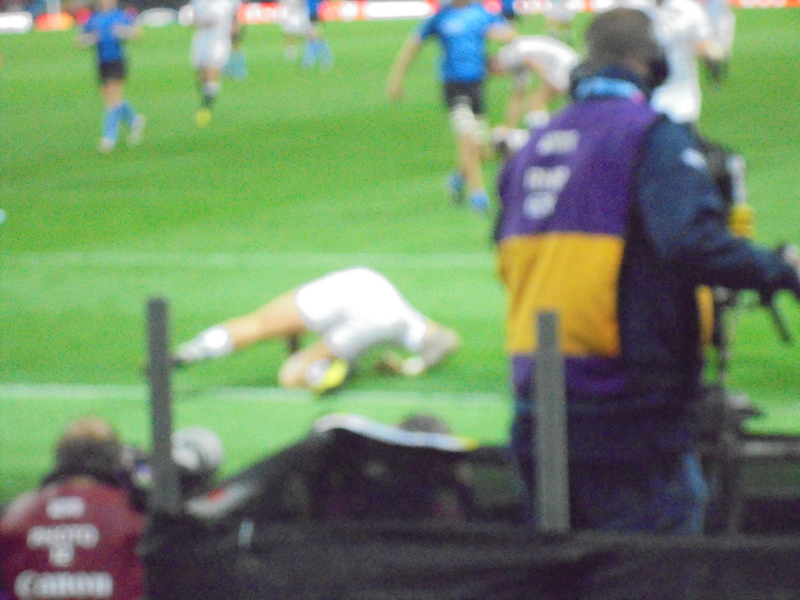 After the half-time break, we then saw them taken apart by the English side, including Owen Farrell, who is definitely a hit with the ladies, if the female a few rows behind me is to be believed on her reactions to his successes. So, upon the end of the 60-3 thrashing, we got to the Met stop quick enough to be in the second wave allowed down to the platform, which was a definite success. 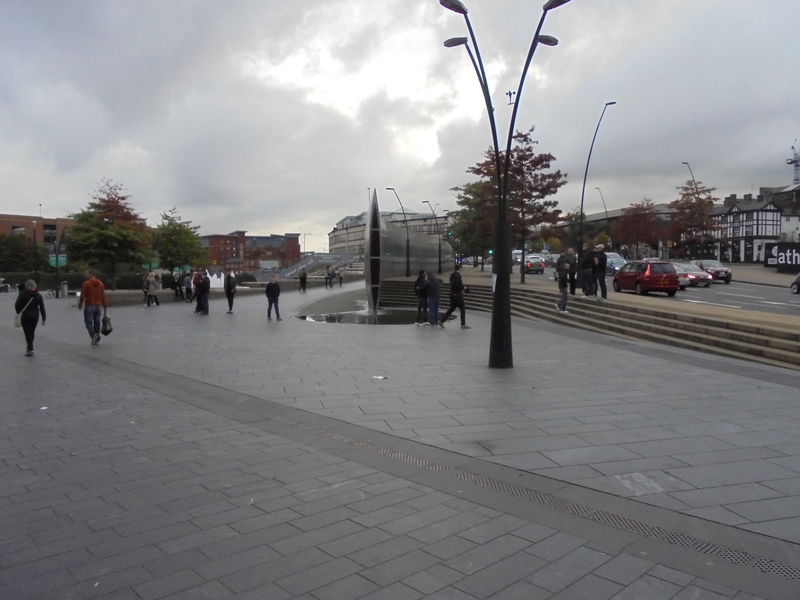 Before too long, we were disembarking in Piccadilly Gardens , where I bid goodbye to Dan (thanks for the tix, by the way) and I continued on to Oxford Road for the last train back to Urmston. A superb day, ticking off two sporting ambitions in it, visit the oldest football club in the World and watch a live Rugby game. Now, what’s next on the list?…. Game: 8- Great game, entertaining. Good goals too. Ground: 6- It was alright, nothing great to speak of. Food: 6- See above for description! Programme: 8- A decent read, full colour publication too. Fans: 8- The old and young mix in the stand was quite something! Value For Money: 9- A great day all round. Another day, another ground. On this bright, fresh Saturday it was a trip to the Lincolnshire/Rutland border to the historic town of Stamford. As usual when an away trip features Trafford, I boarded the team bus for the 2 and a half hour drive south-east. It was unfortunate that this trip clashed with West Didsbury’s trip to AFC Blackpool, but due to this being the last season Stamford will play at this old ground, it had to be done now, otherwise it would be lost in the annals of history. So, after the aforementioned trip was completed, I set off into Stamford Town Centre. 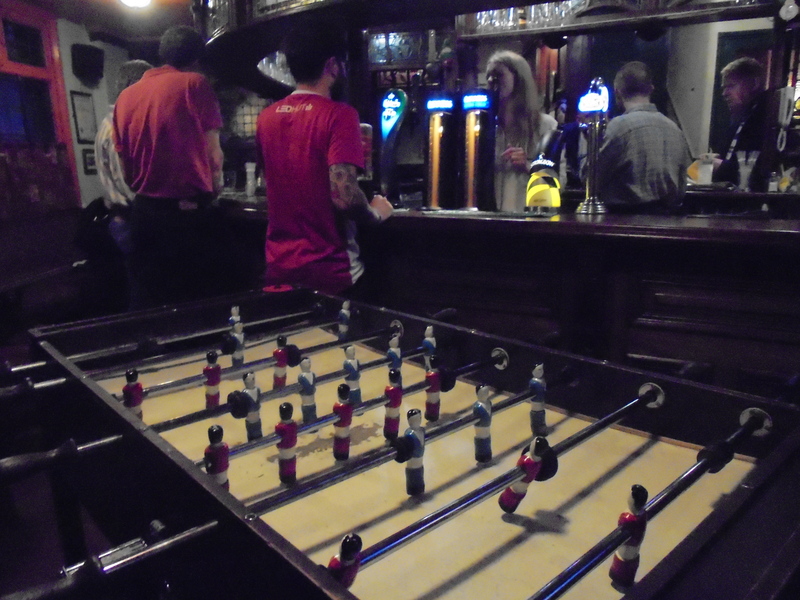 After a quick pit-stop in the St.Mary’s Vault’s pub, which has a separate games room upstairs. A stop in the Sam Smith’s brewery pub which was being visited by an American couple, showcasing Stamford’s historical attractiveness to tourists, both international and domestic, before on the way to the ground an unscheduled stop at The Golden Fleece was made. Here, I met a trio of Stamford fans, who remarked how similar the two clubs are in size and ambition, and how they would happily take 20th place, as I am sure would be a view shared by their opponents today. The Three Stamfordteers made their way towards their spiritual home past a needle structure in front of the pub. We followed soon after. On arrival at the ground after a 5-10 minute walk, including playfully trying to get in as u-16’s, ( based on the ages and appearances we have this was highly unlikely!! 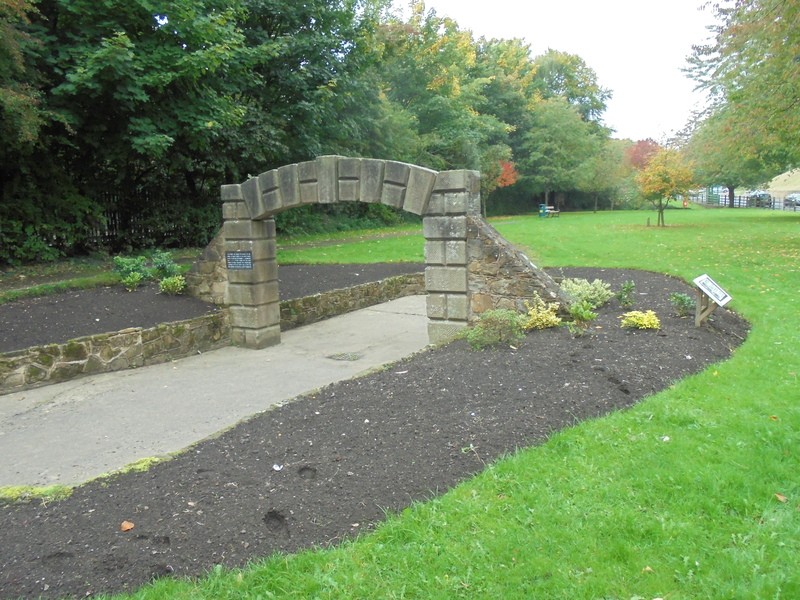 ), I paid the £10 entrance fee, before I was delivered some shocking news. They had run out of programmes!!! A crowd of around 270 had taken all the programmes. This is a very rare occurrence so high up the pyramid. Happily for myself, I later acquired one from long-term Trafford fan Gaz. Cheers. Stamford’s Vic Couzen’s Stadium (Kettering Rd) is a small, somewhat crumbling ground which is why the club are moving imminently. It has two small stands, one on either side of the ground. One is all terraced, two rows deep, whilst the other near-sided ‘Main Stand’ is seated, with ‘SAFC’ emblazoned on the front. 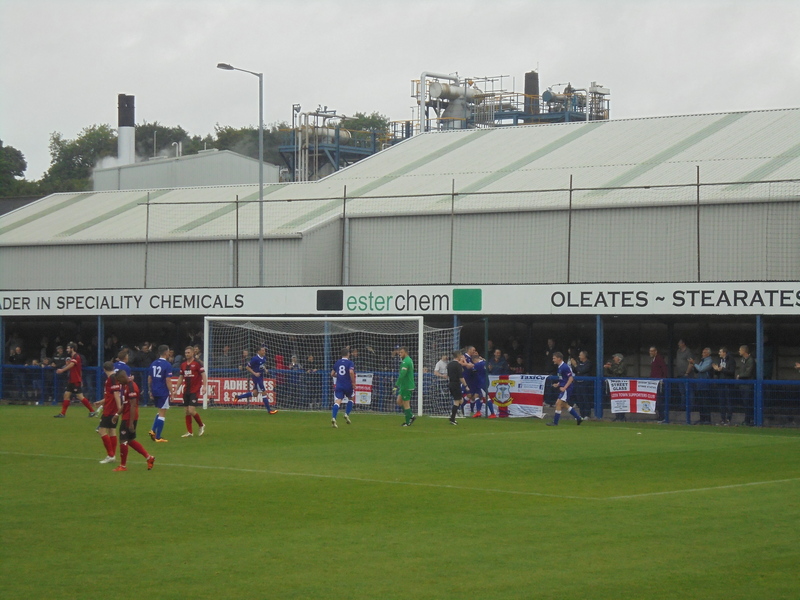 The two ends behind each goal are open, the left-hand goal is accompanied by a very small terrace behind it. 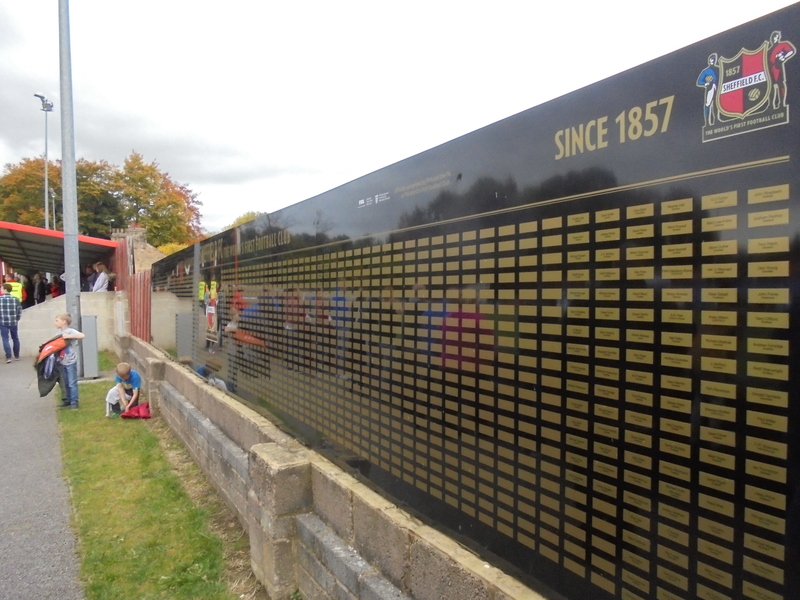 It has a capacity of 2,000, with 250 of these seated in the main stand. Stamford A.F.C. have been in existence since 1896, and are nicknamed ‘The Daniels’. Many of you will already be aware why, but for the benefit of those who aren’t, it is after England’s fattest ever man, Daniel Lambert, who died in the town, and is buried in St.Martin’s churchyard, close to the ground. Back to the club, and after spending their first season in the East Midlands League, and winning their first silverware, a pair of Hinchingbrooke Cup wins in 1906-’07 and ’07-’08, they dropped out of league football for a number of years, until 1909, when they joined the Northamptonshire League, winning the title in 1911-’12. In 1933, the league was renamed the United Counties League. They left this league in 1939, joining the Peterborough & District league for a season. After a break in football due to WWII, they rejoined the UCL in 1946, winning the UCL Knockout Cup in 1951-’52. The same season, the Daniels also lifted the Lincolnshire Senior B Cup, winning the latter cup again two years later. In 1955, the club once again departed the league, this time joining the Central Alliance, before moving on again soon after to the Midland League. In 1972, the club once again rejoined the UCL, and became champions in 1975-’76, as well as lifting the UCL League Cup and Knockout Cup and reaching the FA Vase Final, losing 1-0 to Billericay Town, the most Irish-sounding non-Irish team ever to have existed, after extra time. The league was won again in 1977-’78, going on to win a hat-trick of titles by taking the next two seasons as well, a Lincs Senior Cup (A) was lifted in 1978-’79, and the club picked up a further two Knockout Cups, in ’79-’80 and ’81-’82, (82-83 saw another Lincs Senior Cup (A) win). As well as winning the cup in the former season, the club lifted FA silverware at the second attempt in 1979-80, defeating Guisborough Town 2-0 in the final, but lost 4 years later to Stansted, this time a 3-2 reverse. A further Knockout Cup success followed in 1985-’86. After winning a UCL league title double in ’96-’97 and ’97-’98, along with a Hinchingbrooke Cup win, a further Lincs Senior Cup (A) win and the strangely named Benevolent Cup win in the latter season, Stamford joined the Midland section of the Southern League, which was renamed the Eastern Division, rather than Midland, at the end of their first season. In ’03-’04, the club finished in P7, and achieved promotion thanks to league restructuring, but were relegated after one season. In ’05-’06, they reached the play-offs, going on to defeat Wivenhoe Town 2-1 in the final to bounce straight back up. Their second experience of Premier Division football was a much more successful experience, as Stamford finished 8th, and lifted the Lincolnshire Senior Shield, beating Brigg Town at Lincoln City’s Sincil Bank. 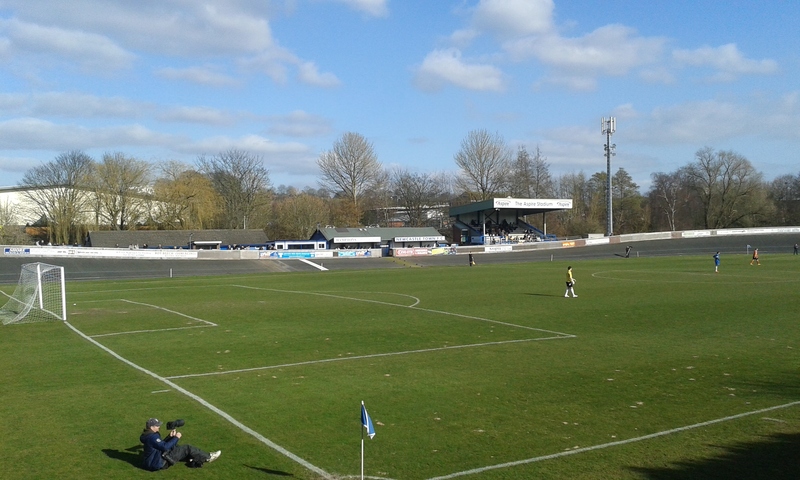 The following season, the club was switched to the Northern Premier League Premier Division, but were relegated after losing their manager, Graham Drury, and half the squad to Corby Town in mid-season. The club narrowly missed out on the play-offs despite a 20-game league undefeated streak, a club record, but did defeat Boston United 4-1 inn the Lincs Senior Shield to soften the blow. In ’09-’10, Stamford reached the NPL President’s Cup final, but lost out to Belper Town, 3-1, at Quorn, where, incidentally, Trafford had won the same competition with a 2-0 victory over Quorn the previous season. 2010-’11 saw a disappointing league performance, but another Lincs Senior Shield was lifted, with Stamford again defeating Boston United, this time via a penalty shoot-out. 2011-’12 saw an improvement in the league, with the club just missing out on the play-offs with a 7th place finish, before Graham Drury’s return in May 2012, replacing Tommy Bookbanks. The club created a small piece of interesting history, by becoming the first sports club in the world to promote their twitter ‘handle’ on their shirt. During this season, it was announced by new chairman Chris Rivett that the club will move to a new stadium on the town’s Ryhall Road. Drury left mid-season for Boston United, with ex-pro player Wayne Hatswell given his first managerial job. This gamble paid off handsomely as Hatswell guided the club to 4th, and the lay-offs, culminating in a 2-1 win over Chasetown at home in front of 864 fans. Hatswell left to become a coach at newly promoted league club Newport County, with his assistant David Staff taking the reins. Onto today’s game, and in all honesty it looked like two struggling sides, battling away for the points in a somewhat turgid contest, lacking in spark, other than Trafford’s captain, Shelton Payne, who netted two goals, and the man whose first goal his two strikes sandwiched, Ryan Robbins. Robbins first was converted from close range following Steve Mason’s slip. Payne’s first was a sweet strike from the edge of the area from Tom Schofield’s daisy cutting corner, and a free-kick delivered via the underside of the bar, past the rooted goalkeeper. Brett Mbalanda spurned a great chance to give the visitors a two-goal advantage, but struck the bar when he ought to have hit the target, the ball going over following the contact with the woodwork. Half-time came and went, with a quick visit to Stamford’s small but smart clubhouse, and a meeting with Stamford’s own non-league dog, before after an action lacking second-half ended in controversy, when in the 92nd minute of 93, Kieran O’Hara, Trafford’s young on-loan Manchester United goalkeeper, had a bit of a rush of blood and connected with Robbins. Despite winning the ball, the assistant on the near side signalled for a penalty, which the referee duly awarded, much to O’Hara’s dismay. I think it was given for intent which could be interpreted as correct, but it was very harsh to call it as a penalty. 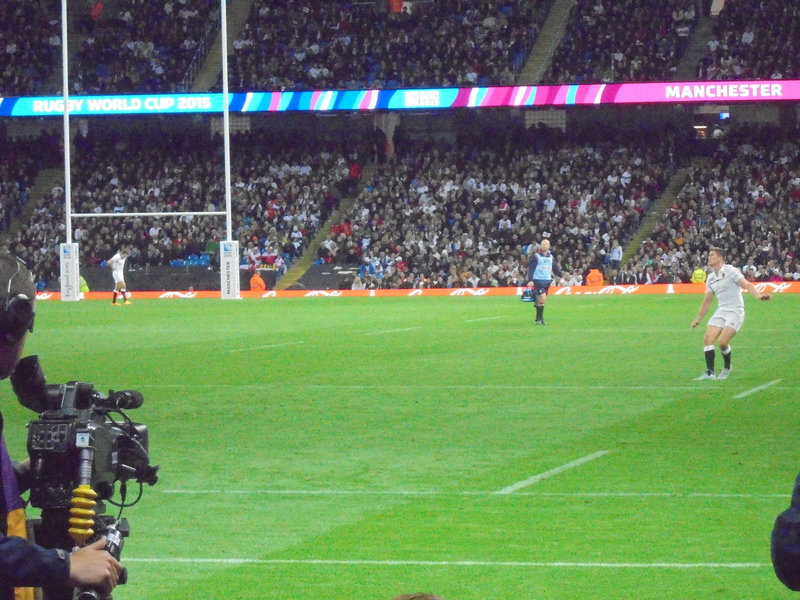 Robbins converted the resulting penalty impressively. It was an unstoppable shot, even if O’Hara had guessed correctly. 2-2 and full-time. O’Hara’s frustrations boiled over at the whistle, as he vented his anger at the officials, before being guided away towards the tunnel, not without a kick of the hoardings on the way off. Game: 5/10- Poor on the whole. Ground: 6- Nice and quaint, but outdated, The club will benefit from their imminent move. Programme: 8- Quite enjoyed the programme. Informative, and some interesting original articles in their too, including Douglas Bader! Food: N/A: Line was too long and never moved from when I saw it! Think some were still waiting as the pen went in! Referee: 6- Felt he missed a fair bit, but did well to defuse the flair-ups that occurred. STAMFORD: 1.Alex Lynch, 2.Shawn Richards, 3.Richard Wesley, 4.Ryan Walker, 5.Richard Jones(c), 6.Jon Challinor, 7.Dan Lawlor, 8.Alvin Jarvis, 9.David Moyo, 10.Jordan Smith, 11.Ryan Robbins(2),(1pen). SUBS 12.Liam Richardson(p), 14.Ash Robinson(p), 15.Jack Ashton, 16.David Staff, 17.Andrew Stevens. TRAFFORD: 1.Kieran O’Hara, 2.Chris Palmer, 3.Luke Heron, 4.Steve Mason, 5.Nia Bayunu, 6.Rory Fallon, 7.Shelton Payne(c)(2), 8.Tom Schofield, 9.Michael Oates, 10.Brett Mbalanda, 11.Paul Ashton SUBS: 12.Jake Parker, 14.Ali Nsangou(p), 15.Clevon Beadle, 16.Omar McKenzie, 17.Callum Jones.